After a decent sleep I went for a run around Alameda Central Park which was just across from the hotel. 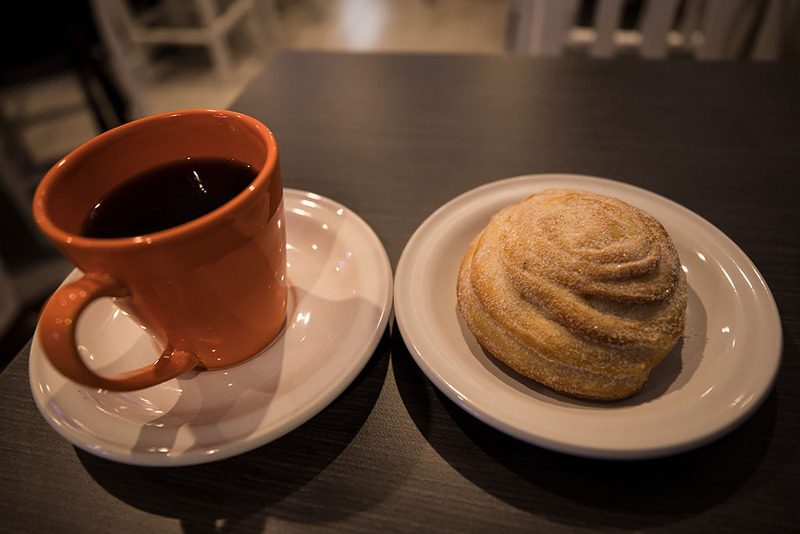 For breakfast I went to a restaurant near the hotel and had a pastry and hot coffee. 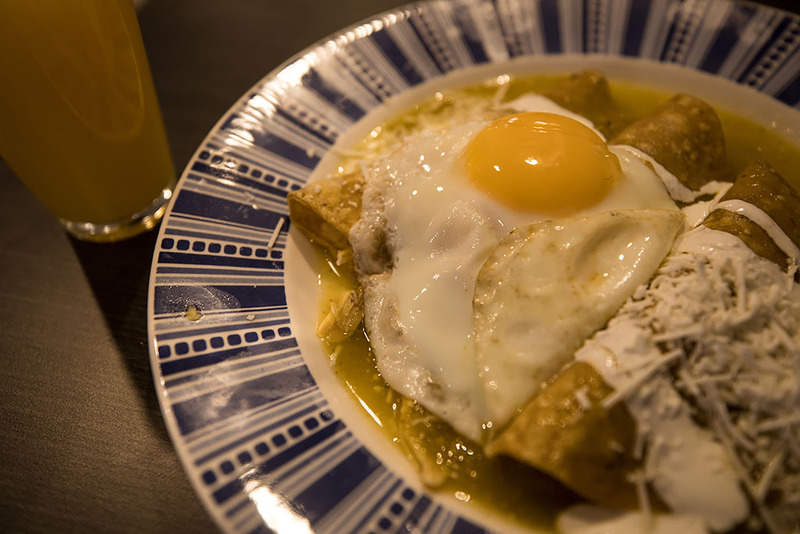 Followed by the very tasty Enchiladas Andriana. Everything was less than $4 so it was a good meal for great value. 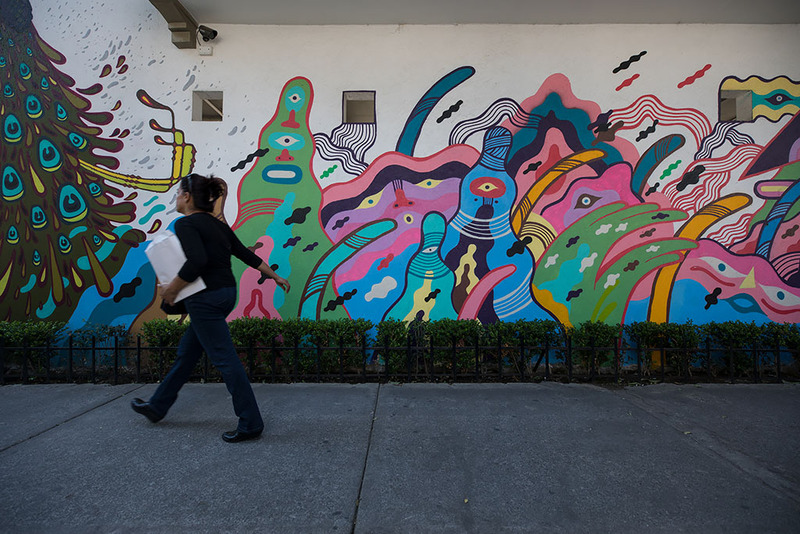 Arte callejero. I then went for a walk to explore some of the local sights. 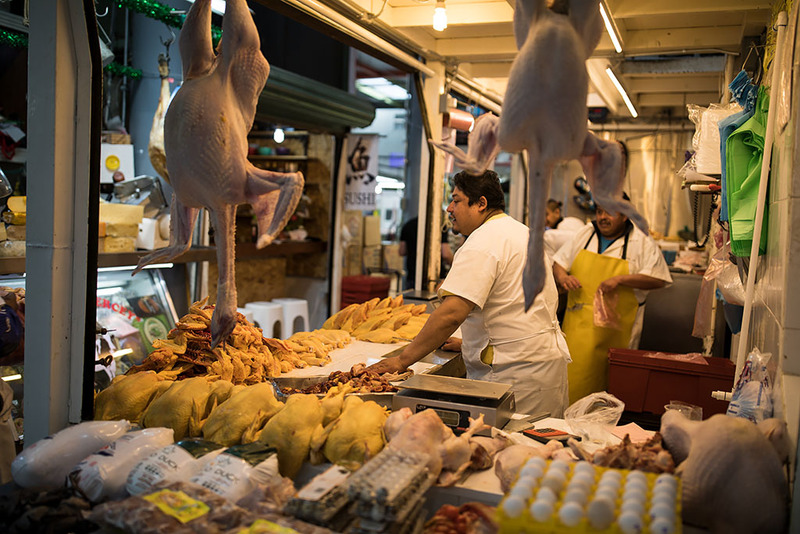 Inside Mercado de San Juan, a gourmet food market in Centro Histórico. I was slightly mystified with the Lion head on the pillar but would soon find out the reason why tomorrow. 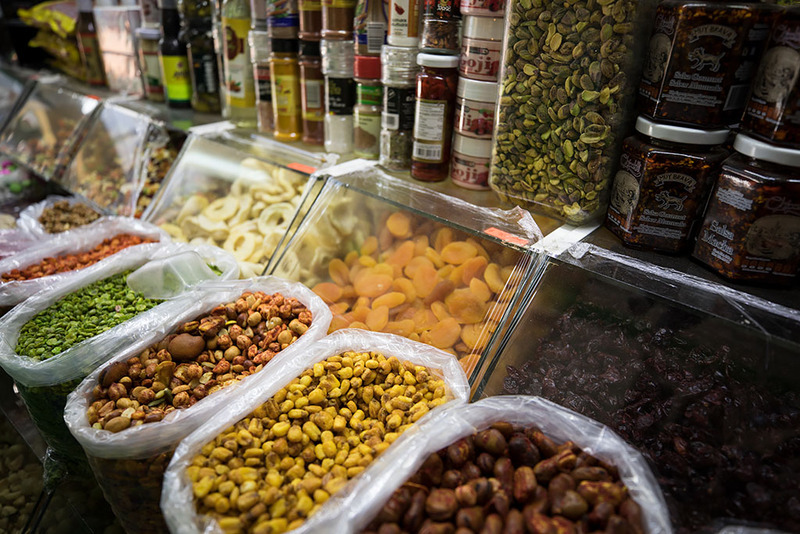 The market was filled with lots of stalls offering fresh and exotic food. 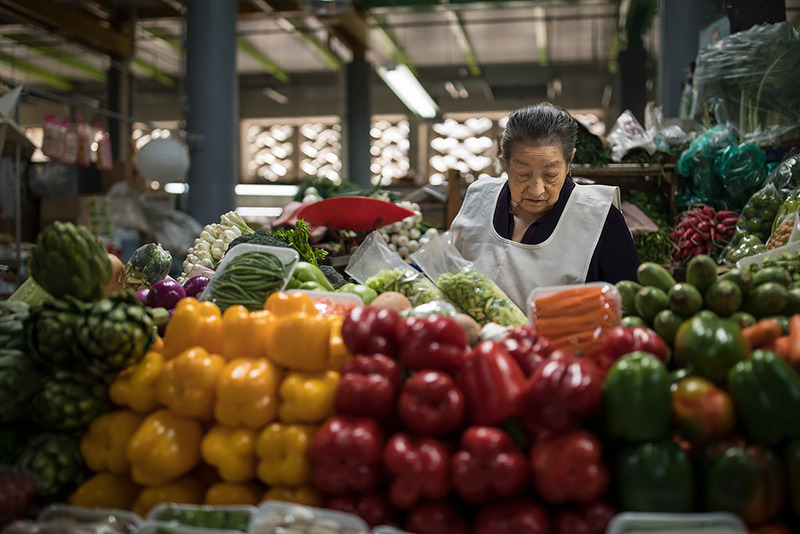 Frutas y vegetales. 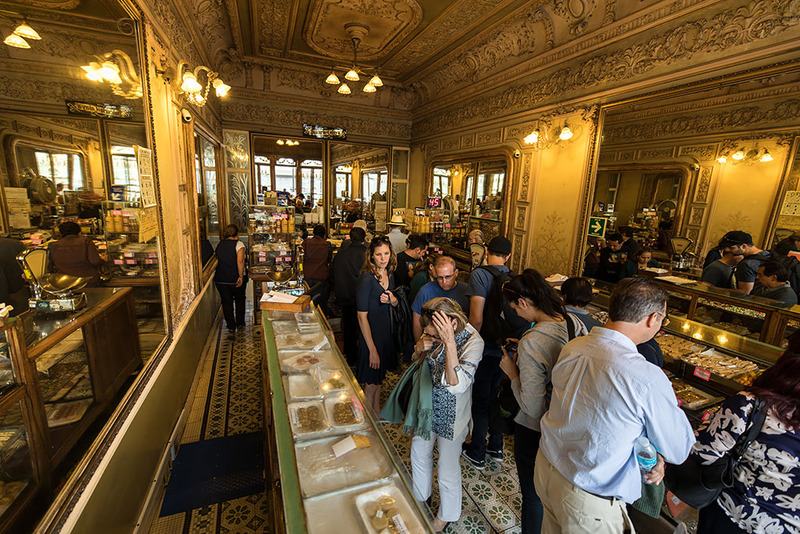 I had booked a food tour tomorrow so would have a chance then to sample some of the interesting food on offer. 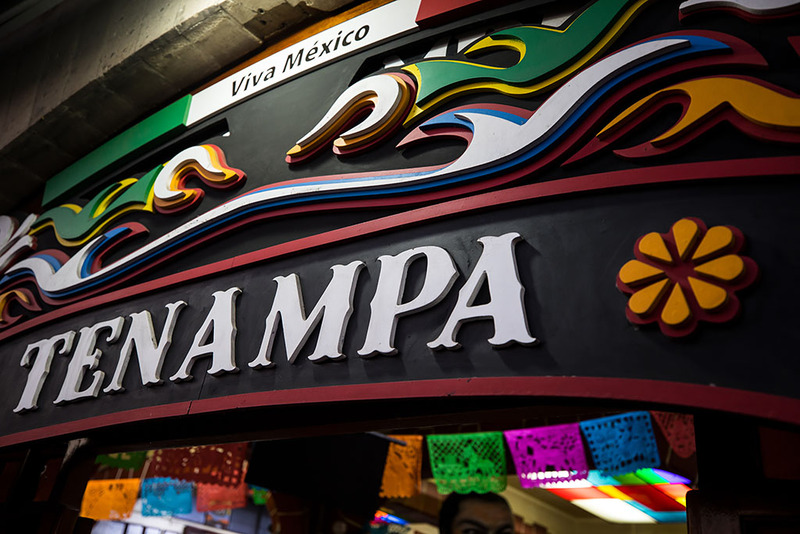 Next stop was Centro de Artesanías La Ciudadela, a traditional style market that specializes in Mexican handcrafts and folk art. 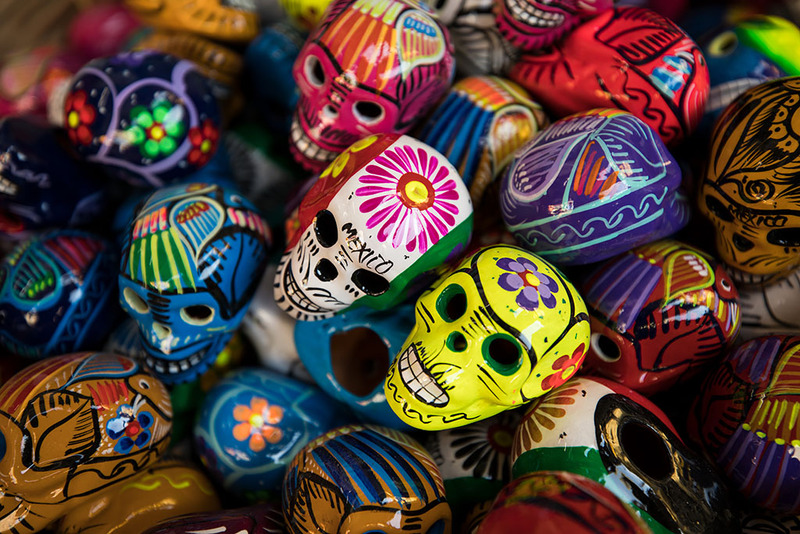 It was first established in 1965 to show and sell Mexican handcrafts as part of the 1968 Summer Olympics. Alot of colourful and interesting goods on offer. I also bought a few souvenirs to take back home. 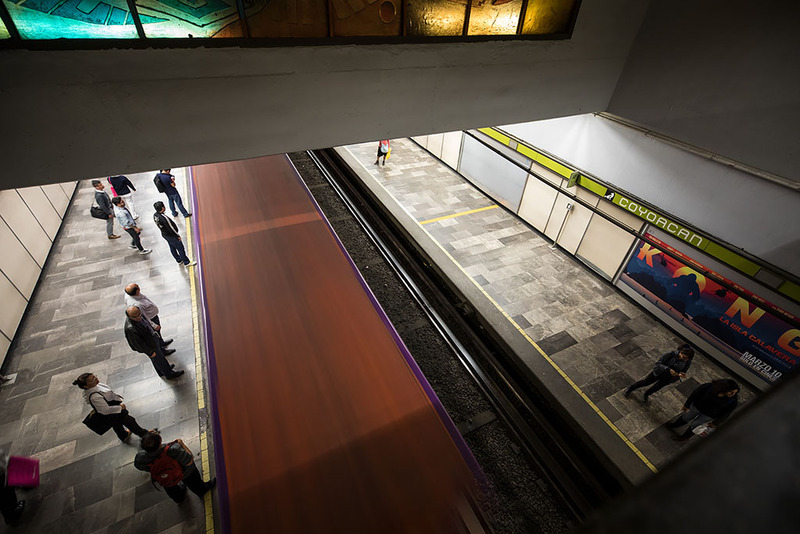 I then headed to the nearby Metro Balderas Station. 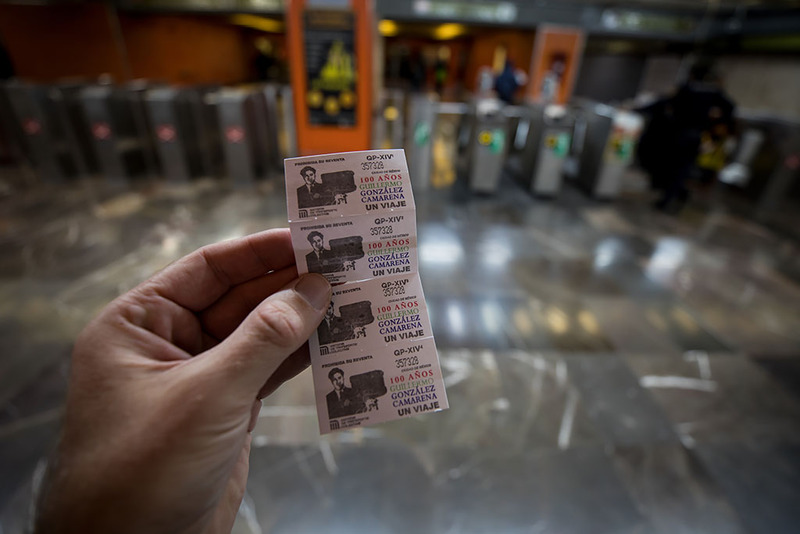 The Mexico City Metro is one of the cheapest in the world at only 5 pesos or ~25 cents per ride. On Line #3 heading south. 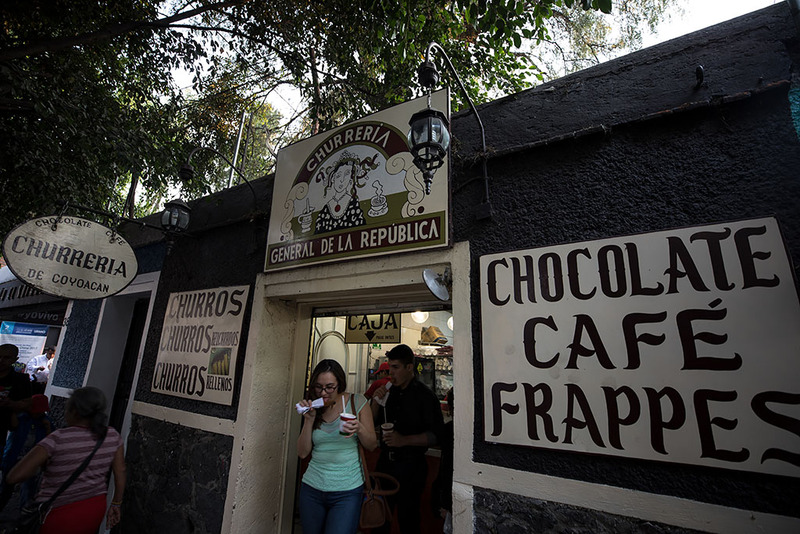 And above ground again in the borough of Coyoacán. 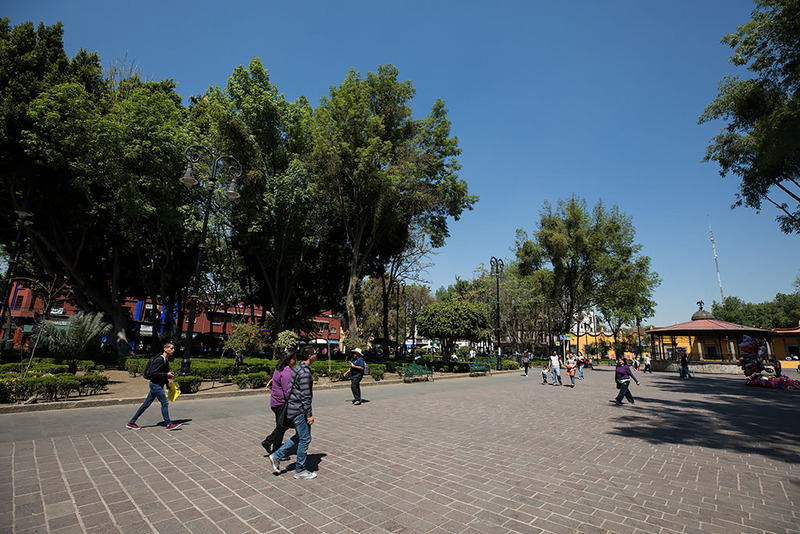 At Plaza Hidalgo in Villa Coyoacán or the historic center after a 1.5 kilometre walk. 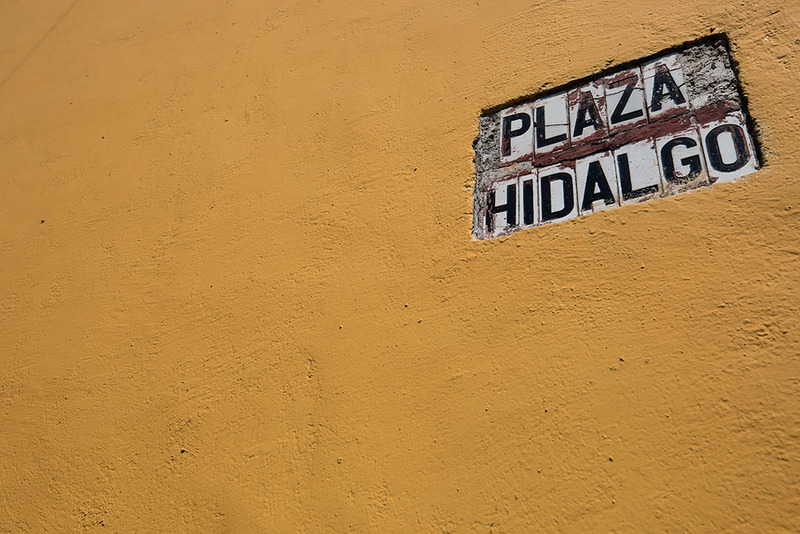 The plaza was named after Miguel Hidalgo y Costilla, a Catholic priest and a leader of the Mexican War of Independence. 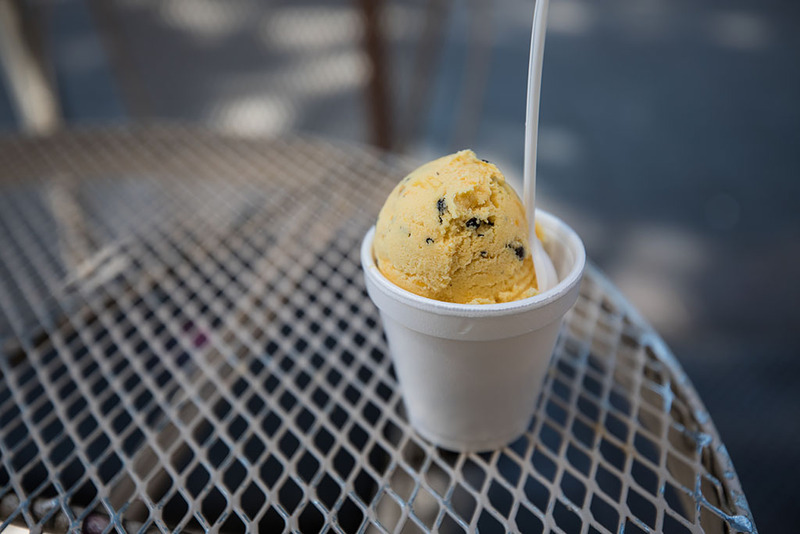 I was getting hungry but it wasn't quite lunch time so had some passion fruit ice cream in the shade. 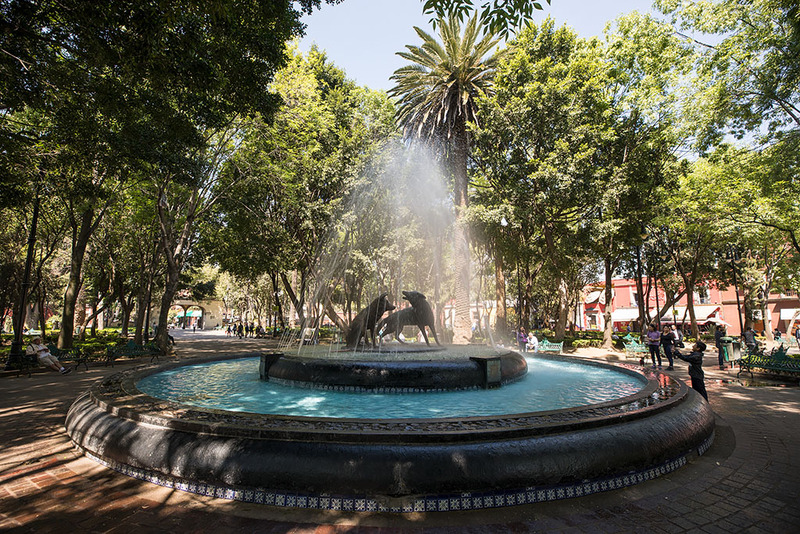 The water fountain depicting two drinking coyotes that gave the town its name at Jardín Centenario. I then walked back through the cobbled streets. 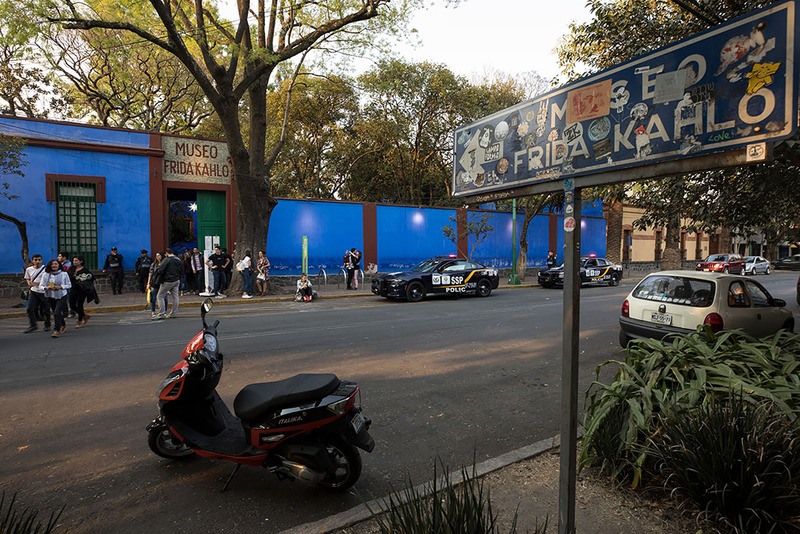 I had planned to visit the nearby Frida Kahlo Museum but the queue was over an hour long. It was possible to buy tickets online (and skip the queue) so I decided to try and come back later tomorrow instead. 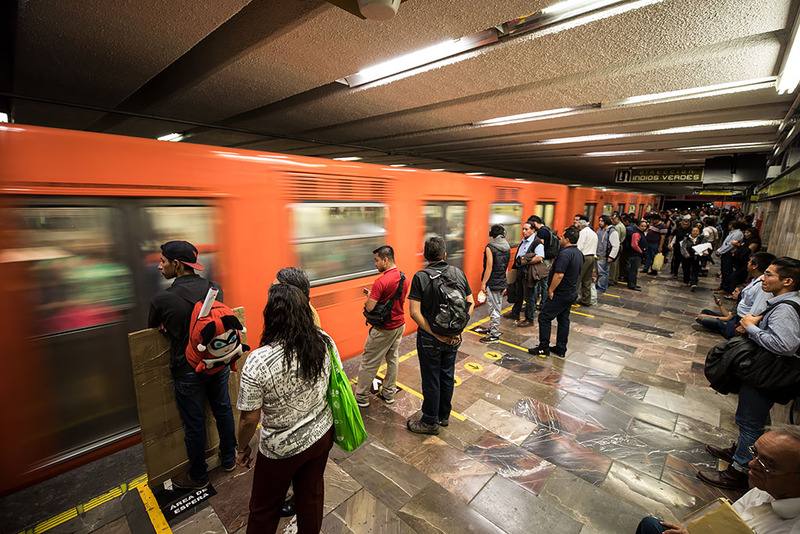 And back at Coyoacán Metro Station to head north to the borough of Roma Norte. 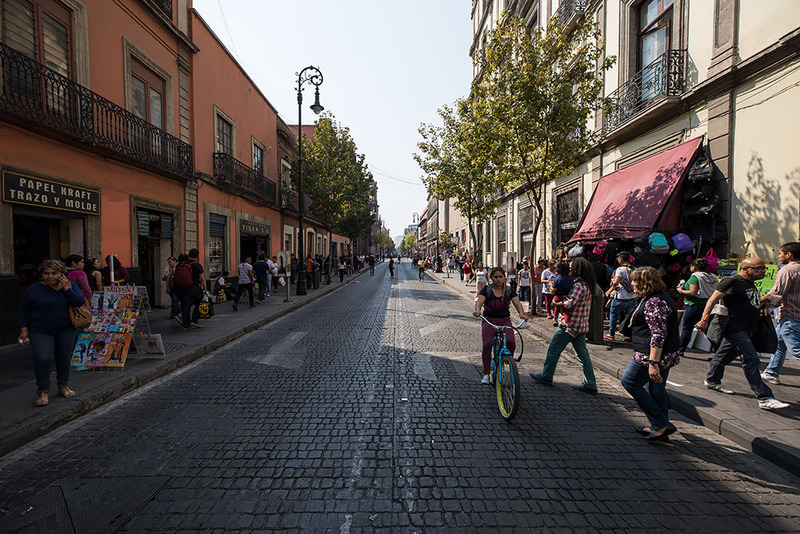 Roma Norte was filled with beautiful buildings and tree lined streets. Sprinkled throughout the neighbourhood were cafés, restaurants and little boutiques everywhere, lots of street art and plenty of small parks about. 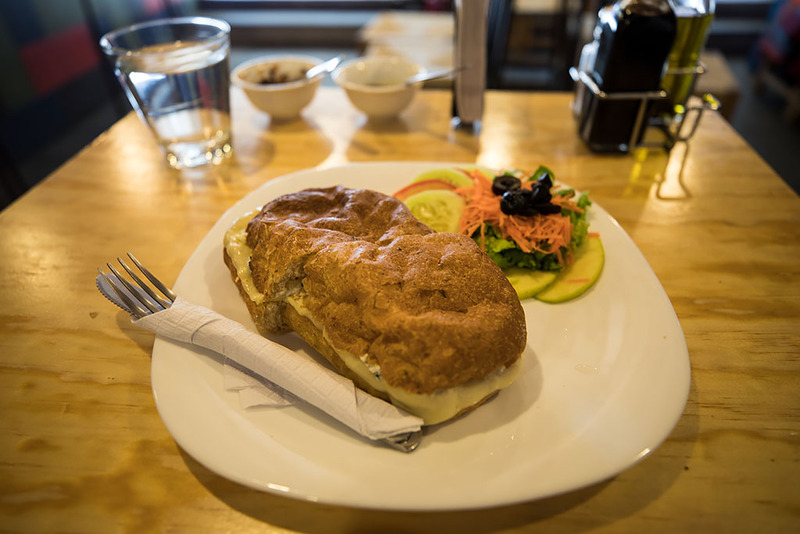 It was just after 2pm so I went to a small café and had the tres quesos sandwich for a very reasonable 55 pesos. 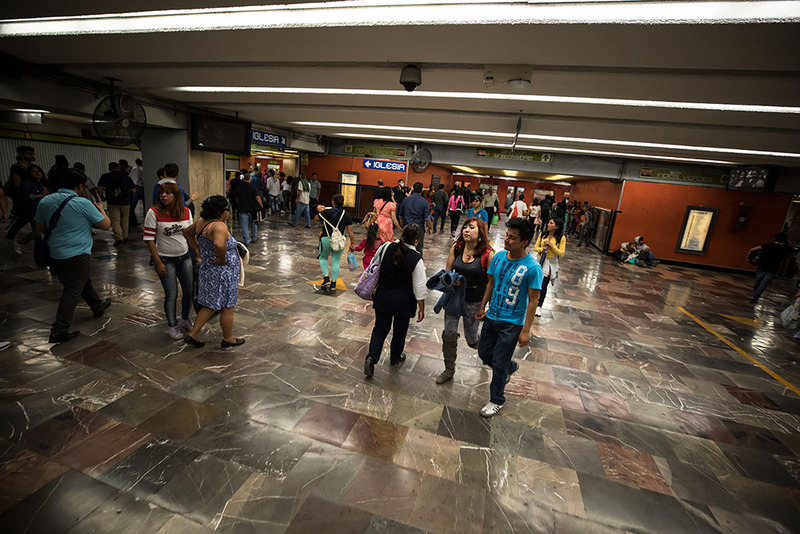 After the enjoyable stroll through Roma Norte I then caught the metro back to Centro Histórico and back to my hotel. 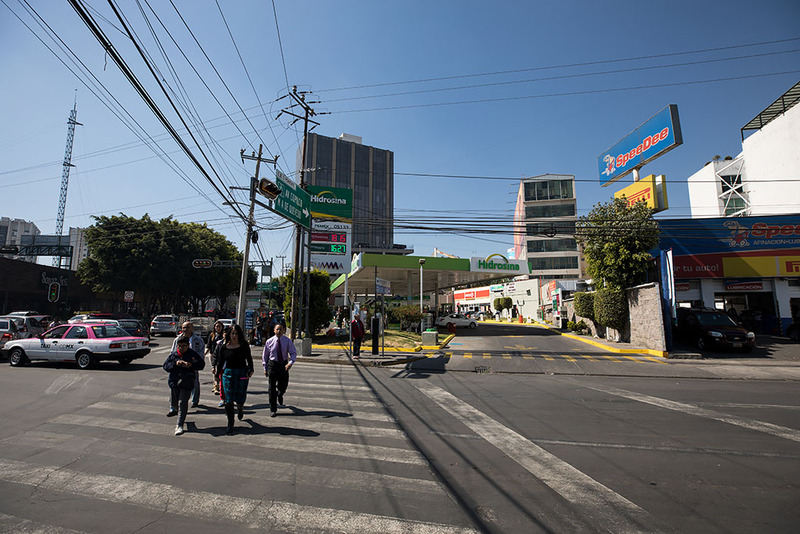 At about 4:30pm I headed down to Francisco I. Madero Avenue again to meet up for a 'Cantinas, Mariachi and Lucha Libre' tour. The Avenue was packed with both locals and tourists out and about. I had my iPhone in my shorts pocket and while walking through the busy crowd felt my pocket suddenly become light. 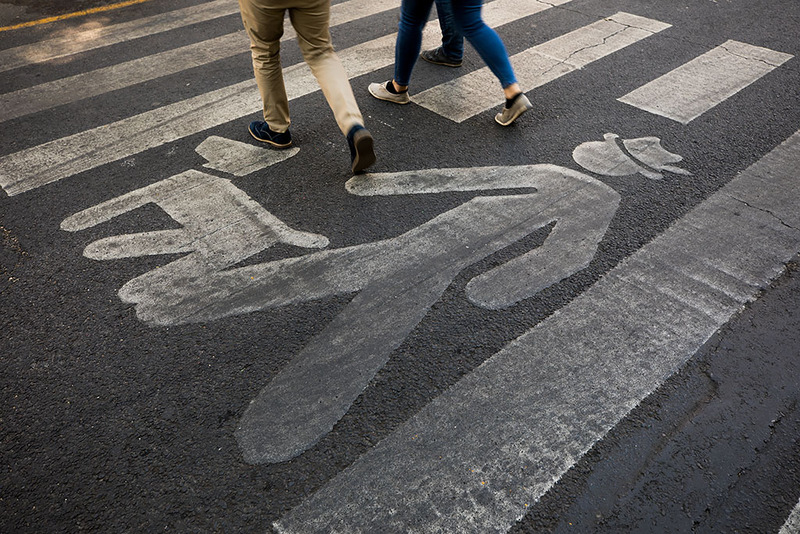 I turned around to a girl and her boyfriend who were walking close to me and shouted 'What the f#*k!' The girl quickly pulled my phone out from under a scarf she was wearing and calmly said something in Spanish. I wasn't sure how to react so just snatched it out of her hand and counted my blessings for the close call with a pickpocket. Meeting up with Miguel just before 5pm. There was two Aussie couples and a few Americans on the tour. Mike from LA on the far right was wearing an amusing t-shirt with Donald Trump in military style uniform with the words just below "Not my dictator". 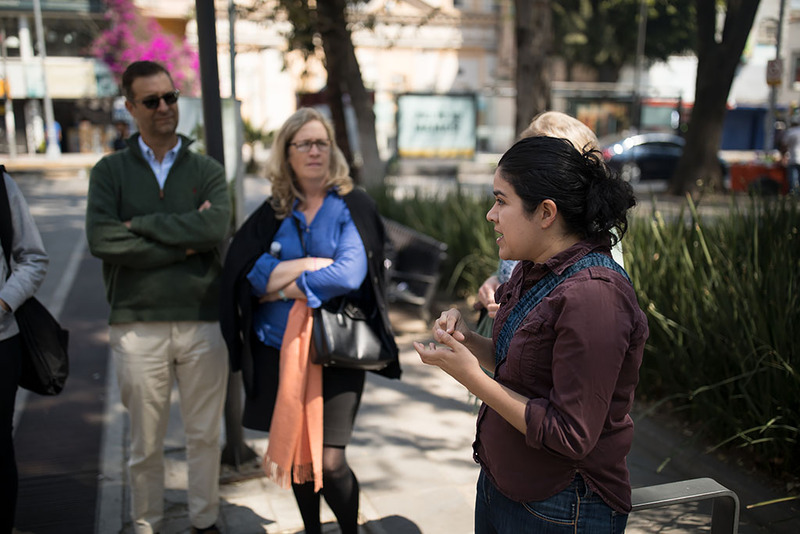 Our first stop of the tour was Torre Latinoamericana, a skyscraper in Centro Histórico completed in 1956 and was the city's tallest building until 1984. 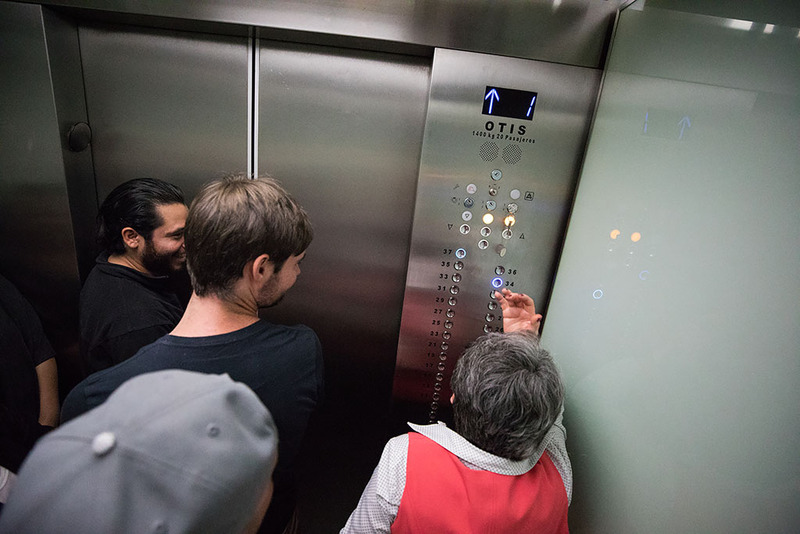 The elevator attendant taking us up to the 37th floor. 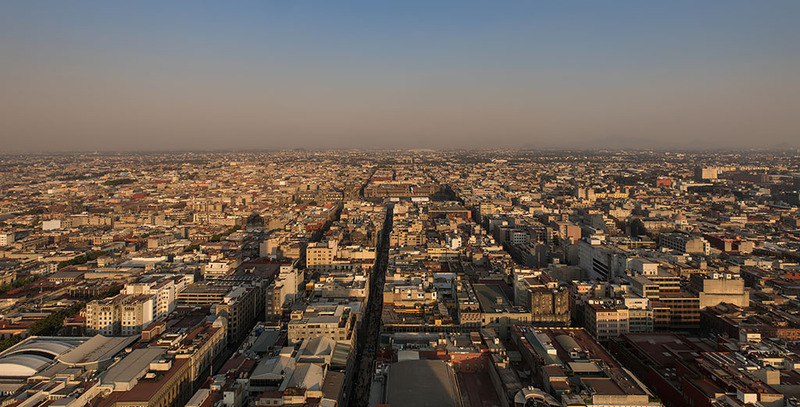 Looking east out onto the city from the top of the tower with the Zócalo in the middle distance. 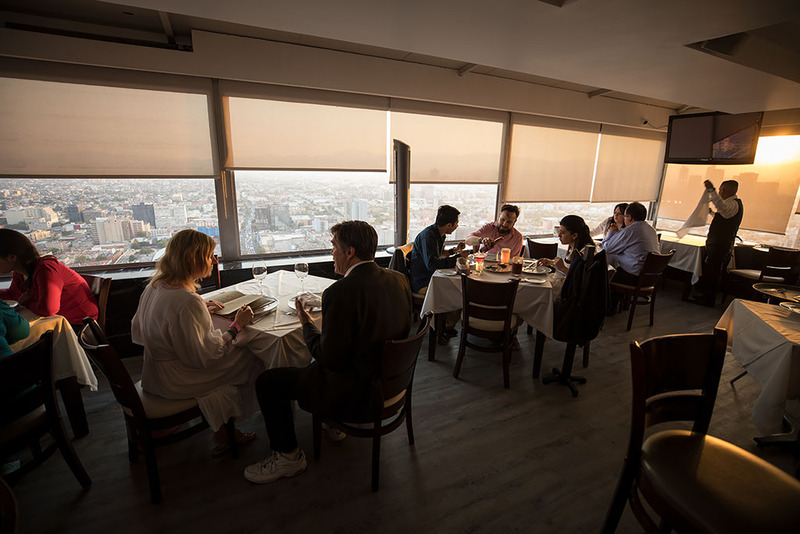 At Miralto, the restaurant and bar at the top of the building. The sun was starting to drop down towards the horizon so we were bathed in lovely warm light. 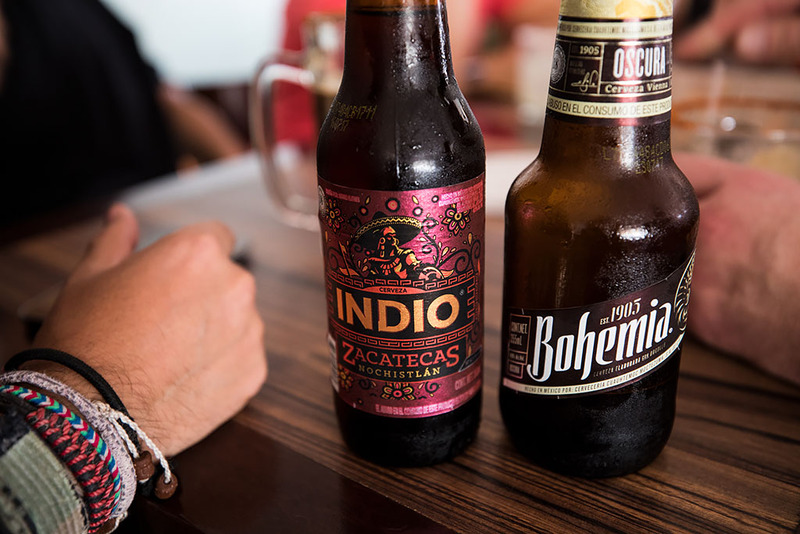 Enjoying some cervezas / beer at Miralto. 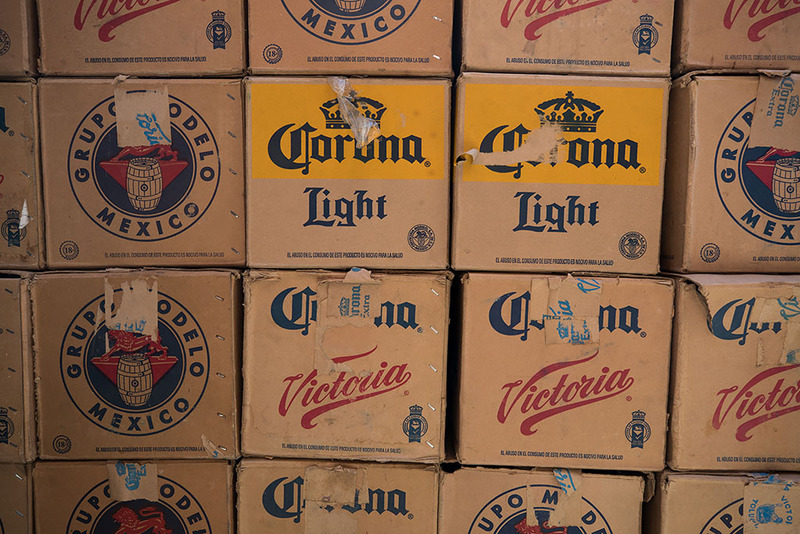 Miguel forbid us from having Corona and recommended some tasty local beers instead. I opted for a bottle of a dark Mexican beer, Bohemia Obscura. And looking west to the setting sun with Alameda Central Park just below middle right. 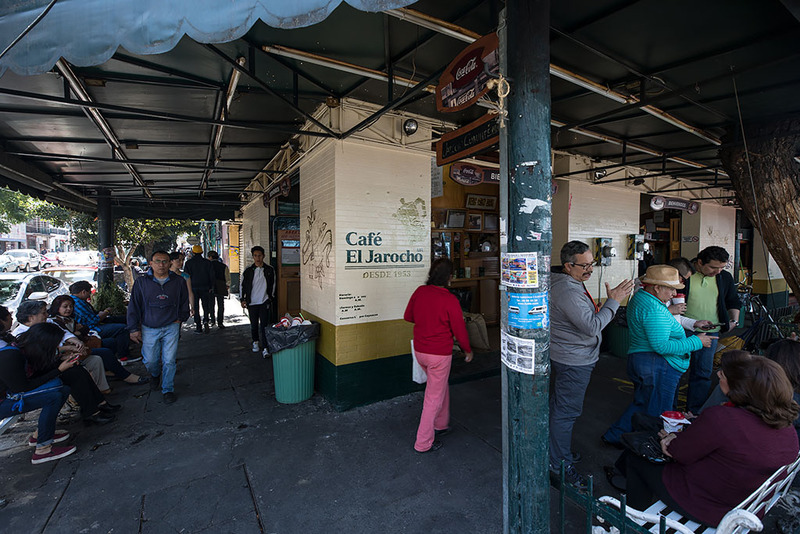 After the tasty cervezas up Torre Latinoamericana, we headed back down to street level and walked north along Avenida Lázaro Cárdenas. 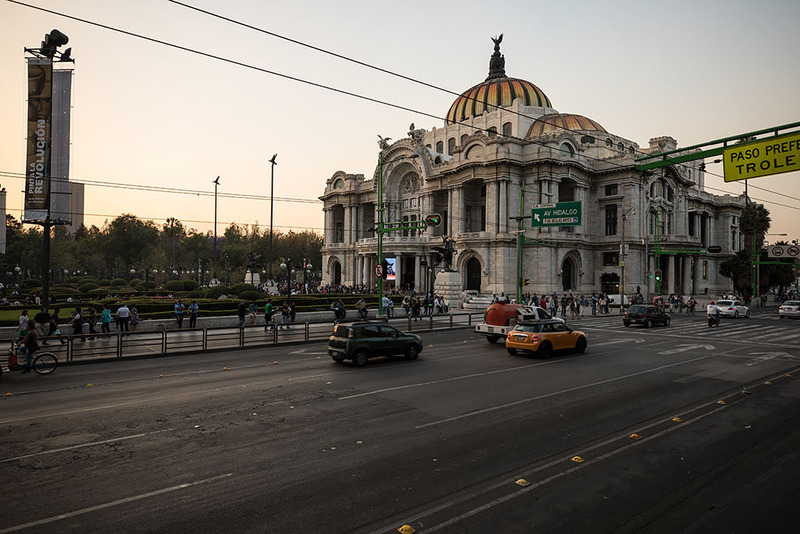 Across the road is the very beautiful Palacio de Bellas Artes. 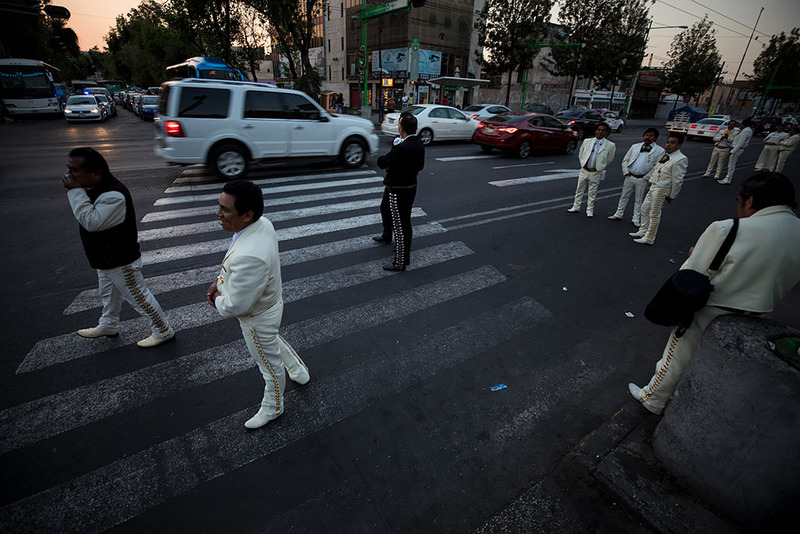 Mariachis on the side of the road as we got closer to Plaza Garibaldi. 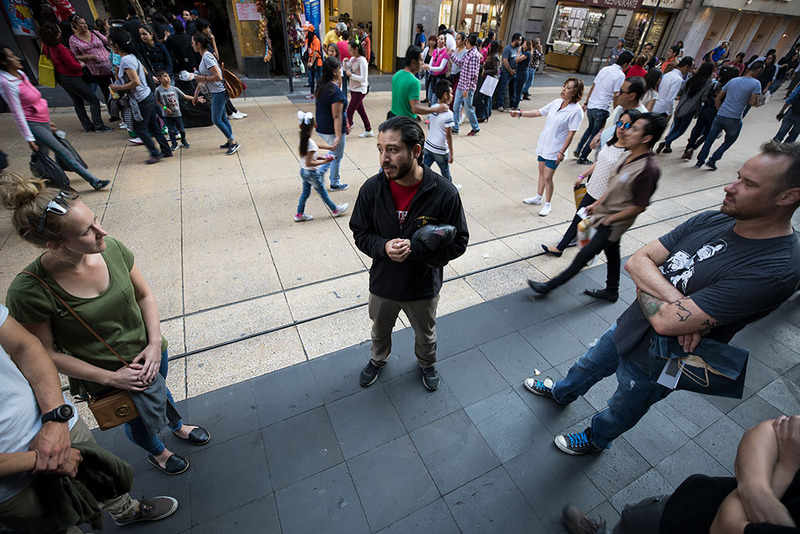 At Plaza Garibaldi Miguel gave us a brief history of both the plaza and Mariachi. 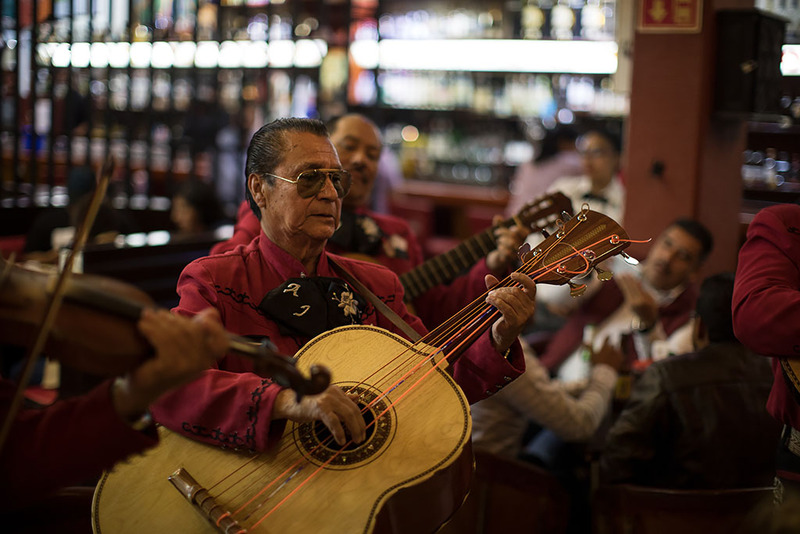 With Mariachi introduced to Mexico City in 1905, the plaza became the city's home of the music. In the plaza there were numerous mariachi bands playing and soliciting gigs. 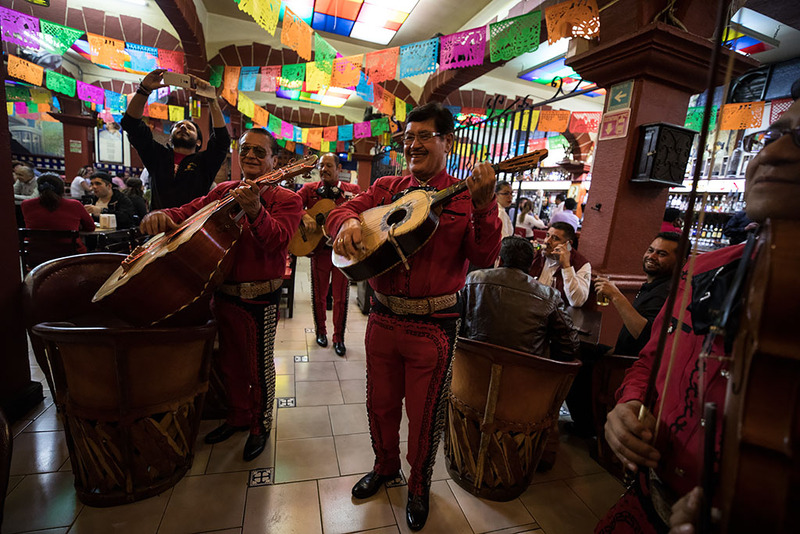 In 1923, Juan Indalecio Hernández Ibarra from Jalisco, the birthplace of mariachi, started a cantina on Plaza Garibaldi, naming it El Tenampa, and where we would be dining tonight. 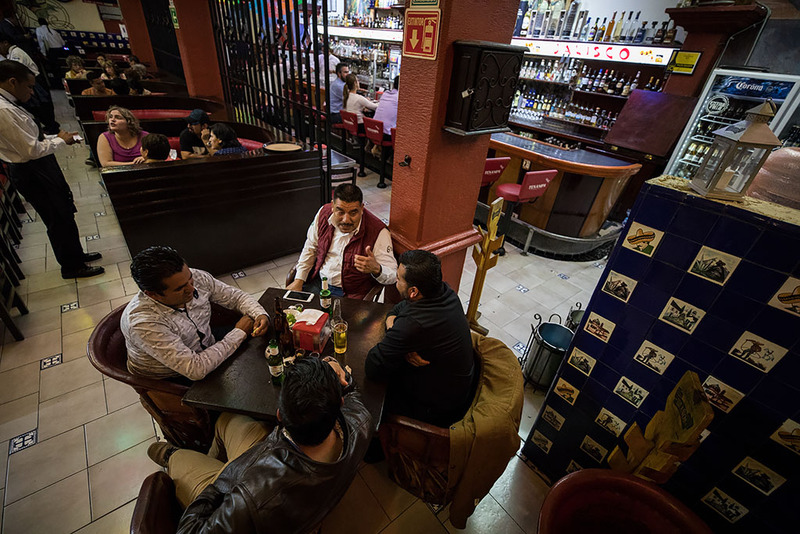 Hernández opened the establishment to give his fellow “Jalisquenses” a taste of home with local foods such as birria and pozole, as well as tequila and mariachi music. 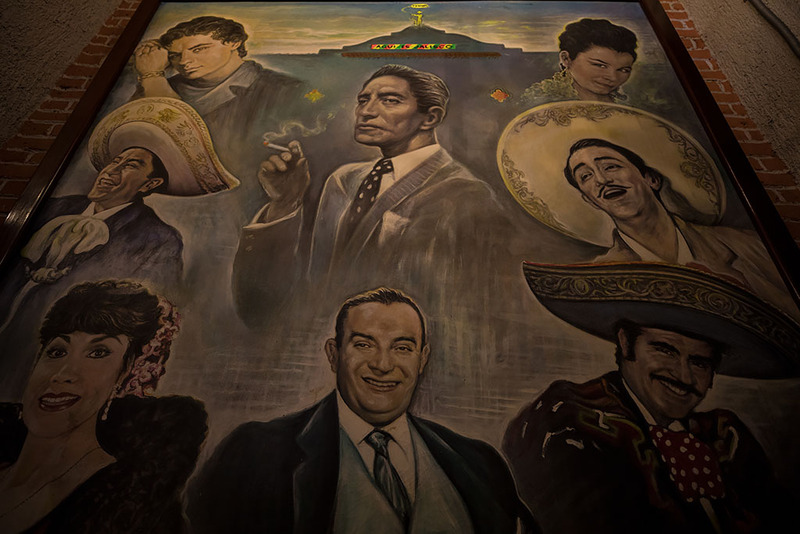 Over the decades, the establishment has hosted kings, princesses, presidents as well as numerous politicians, artists and intellectuals from both Mexico and abroad. Apart from us gringos it was only locals at El Tenampa tonight. After taking our seats at our reserved table and making our drinks and food orders, our dinner was soon on the way. My cecina for 100 pesos. 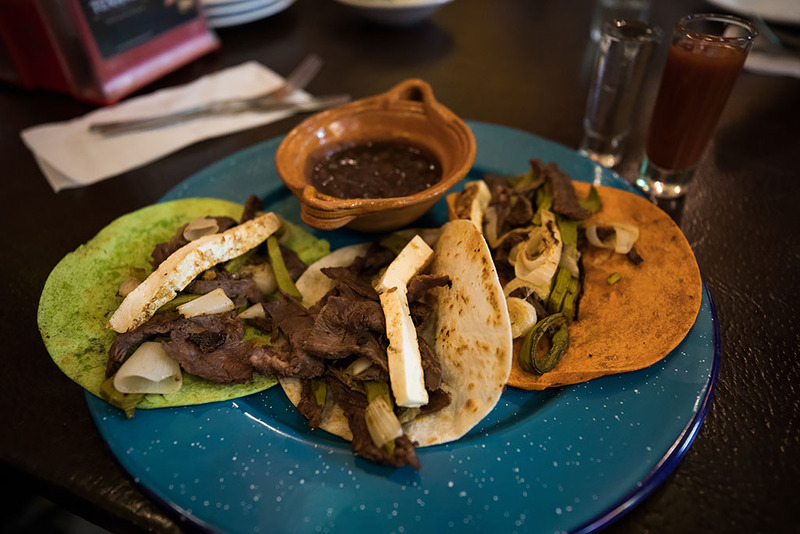 Delicious cured meat with white cheese, cactus pad, onion cambray and three different kinds of flour tortillas. My Tequila Nacional, representing the three colours of the Mexican flag (lime = green, tequila = white and tomato juice = red). 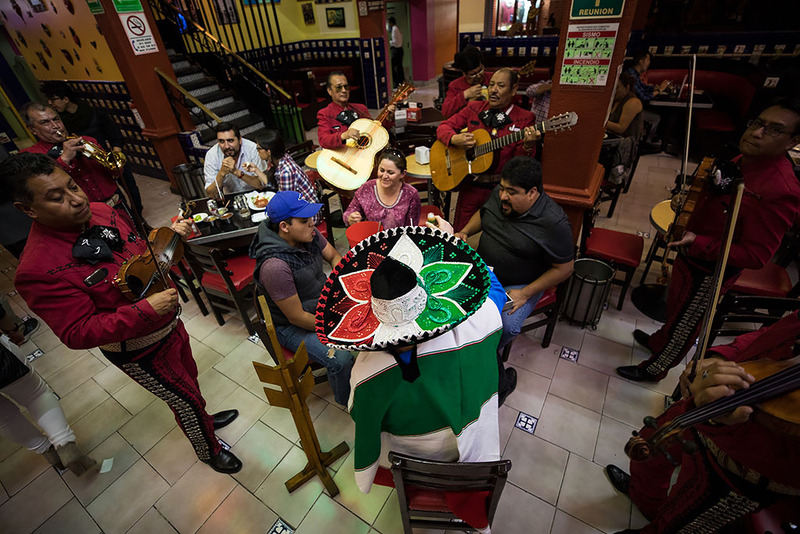 While eating dinner it soon became our turn to be serenaded by the Mariachi! 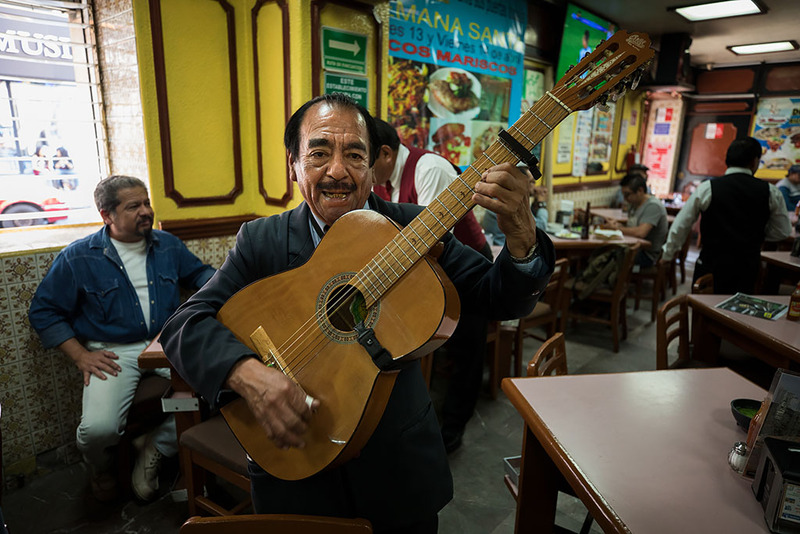 A Mariachi with a guitarrón mexicano, a big six-string acoustic bass for rhythm. 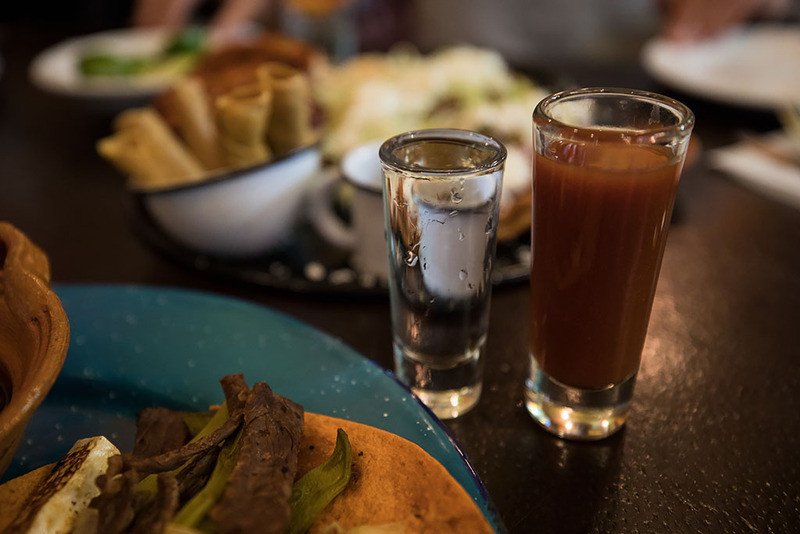 It was a great performance and with the authentic cuisine and drinks, it was a very memorable Mexican experience, definitely recommended! 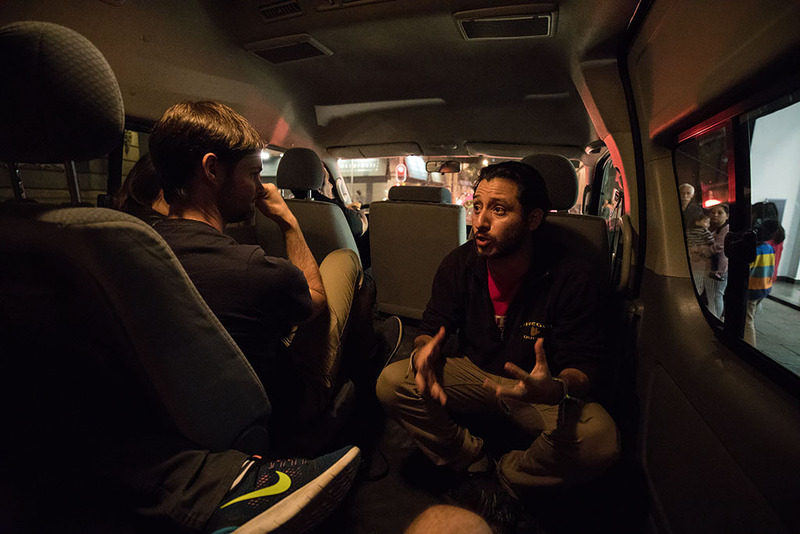 After our fabulous dinner we headed off in a minivan to Arena México. 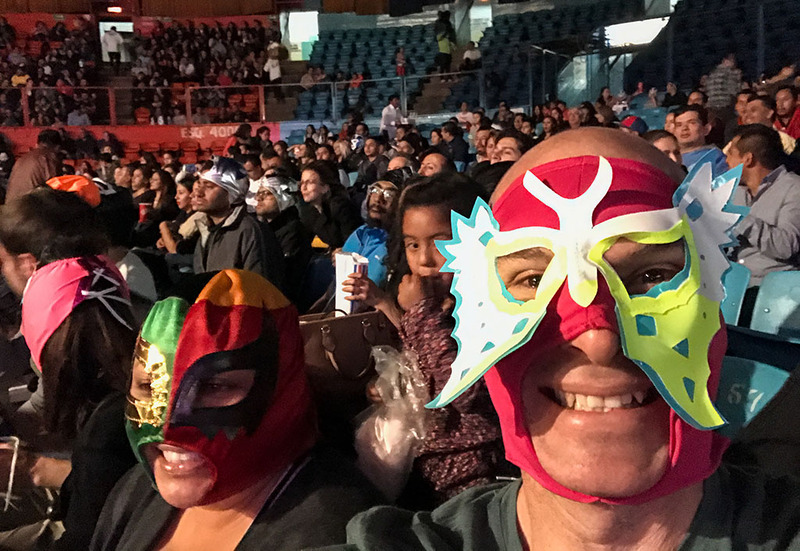 The tour included a Luchador mask each, although we weren't allowed to put it on until we got inside the arena so that security could see our face. Camera's were also not allowed inside the arena but luckily taking photo's with your phone was ok.
My ticket for the evening. 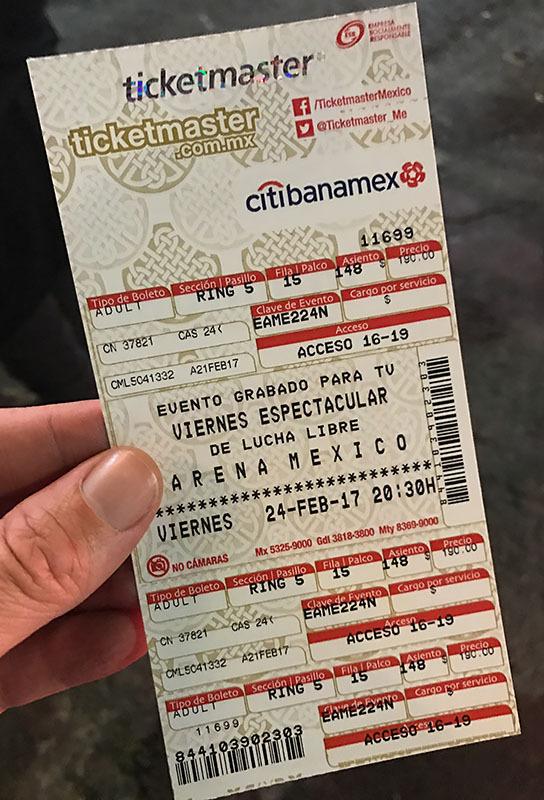 It is very possible to see the Lucha Libre by yourself, but I was happy to pay a bit extra for the tour which was only $55 each. 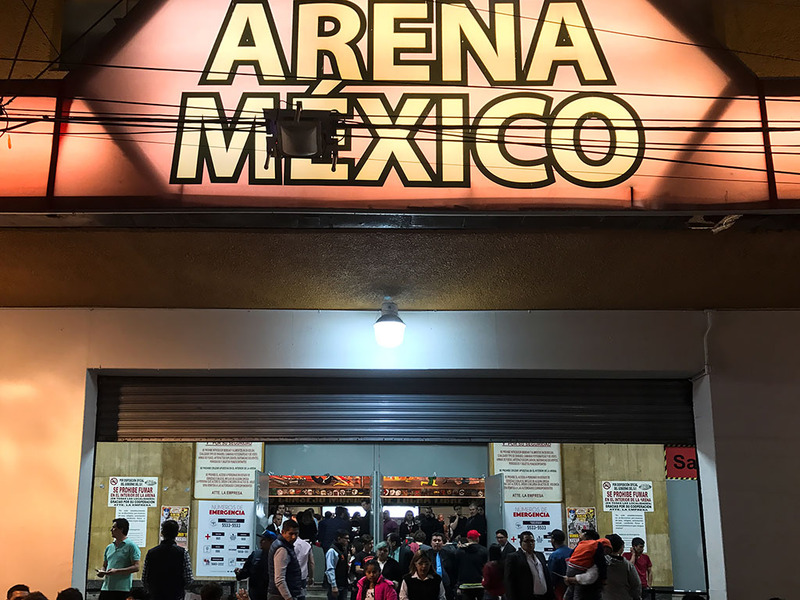 And about to enter Arena México to experience some Lucha libre. As it was a Friday evening it was quite busy with lots of people out to get a dose of Lucha Libre at the start of the weekend. 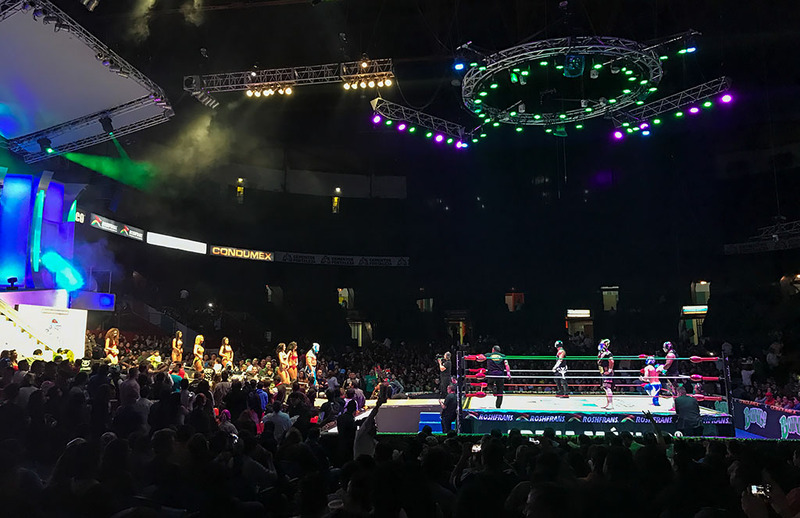 Inside at the start of the first match with plenty of chicas in bikini's welcoming the luchadores into the ring. 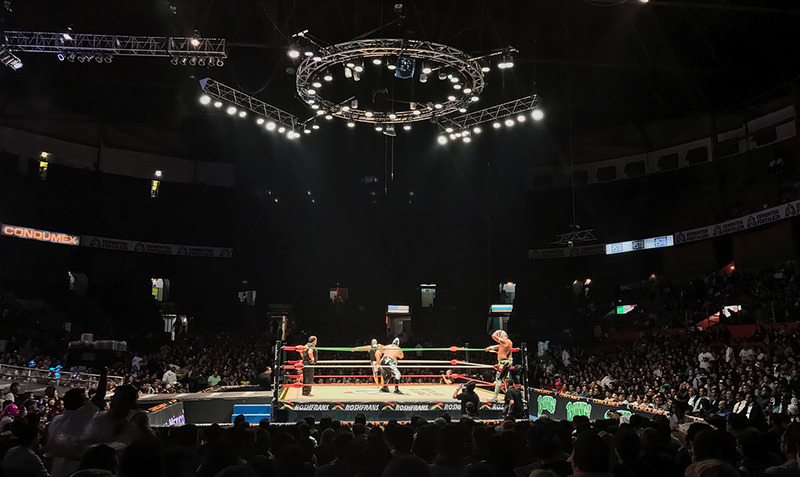 The first match underway with the luchadores duking it out to the delight of the crowd. 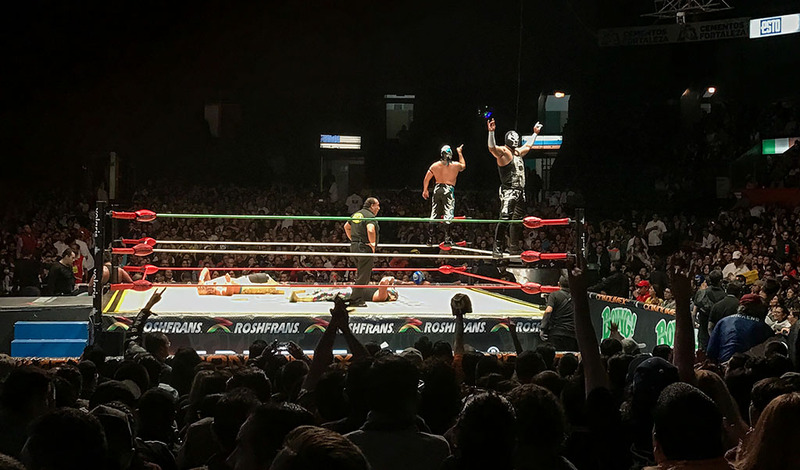 Arena México was completed in 1956 and is the largest arena built specifically for wrestling. Of course I couldn't resist taking a selfie while wearing my luchador mask. 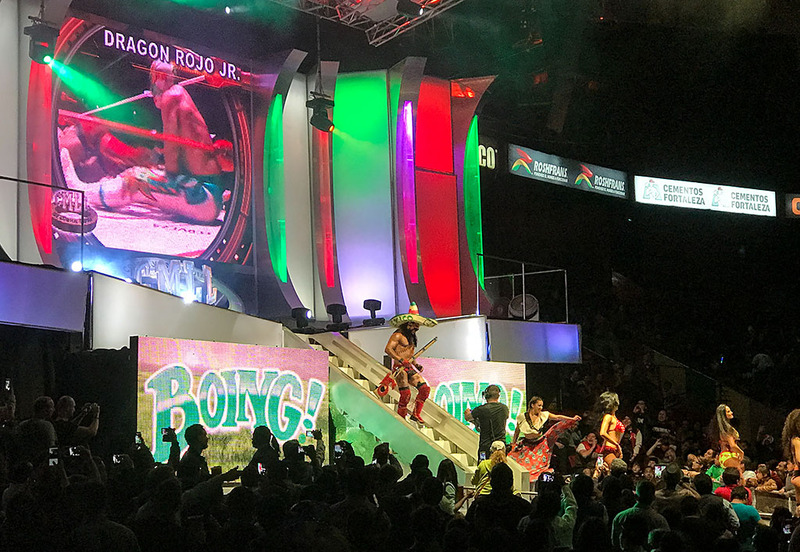 The physical feats and crazy theatrics were very much just as amazing and maybe even more so as the professional wrestling in the US I had seen on TV. The victors gloating over the beaten and defeated. A luchador complete with sombrero and rifle about to face the Dragon for the final match of the night. 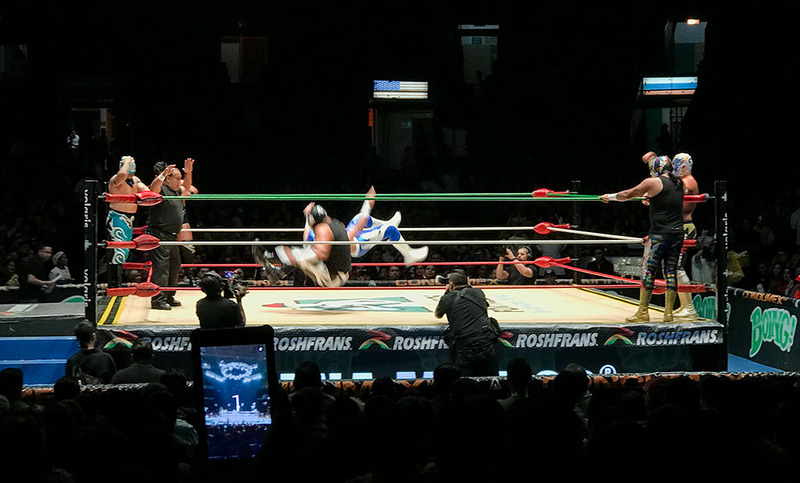 The Lucha libre was a great experience, both to take in the spectacle of the amazing luchadores and to see the locals get riled up and entertained by their theatrics and crazy atheticism. A very cool and memorable evening! 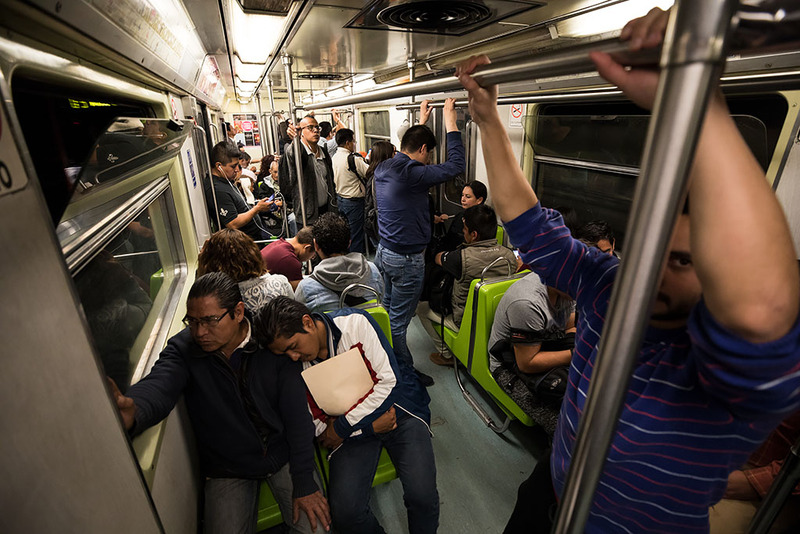 At about 10:30pm after the end of the last match we piled back into the minivan for the ride back to Centro Histórico. After saying farewell and thanking Miguel for an awesome night, I made the short walk from Alameda Central Park back to my hotel at the end of another very enjoyable day in Mexico City. 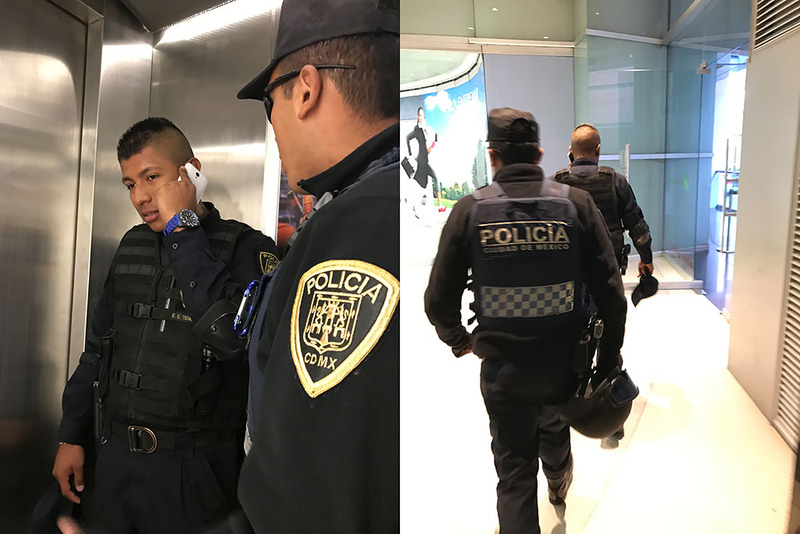 After a good sleep in and another run around Alameda Central Park, I caught the elevator down from the hotel with a couple of Polícia, ready for another day in Mexico City. Today's plan was a food tour through Centro Histórico, so I opted for a light breakfast at Café Emir. 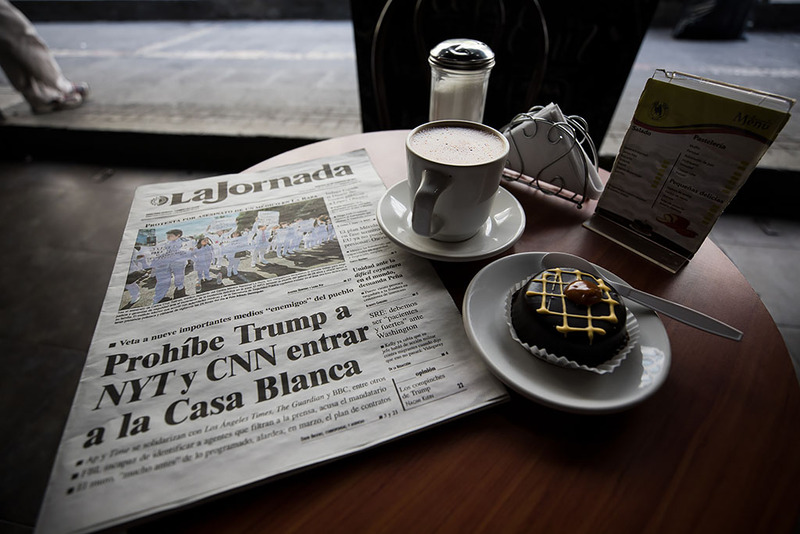 The headline on the local newspaper was about how the White House had blocked several news organizations from a press briefing. 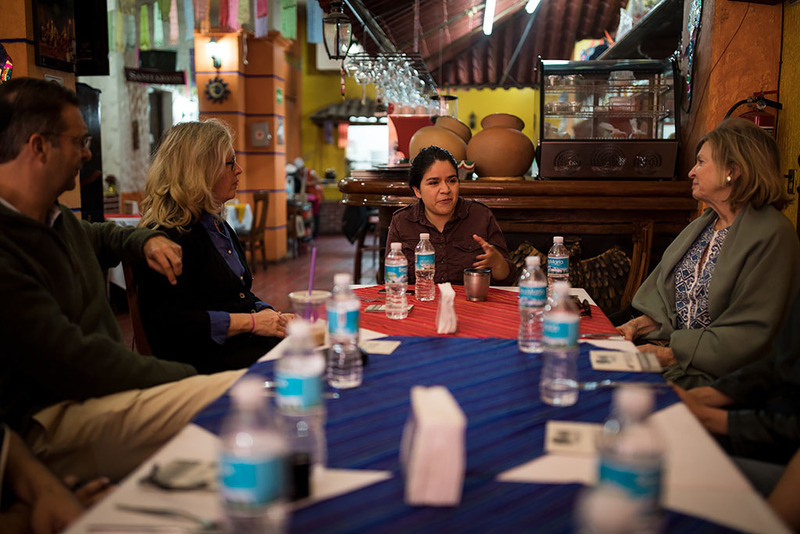 Just before 11am I met up for the start of the food tour at Restaurante Oaxaca en Mexico. 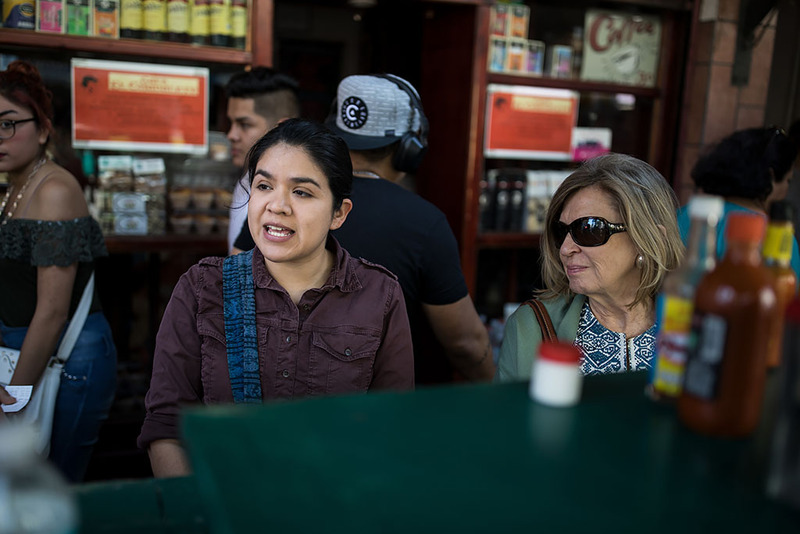 Carina, our guide today, was born and bred in Chicago but had moved to Mexico City about 10 years ago and had now become a naturalised citizen. Also on the tour was a couple from Australia and some Americans from Miami, Texas and New York. 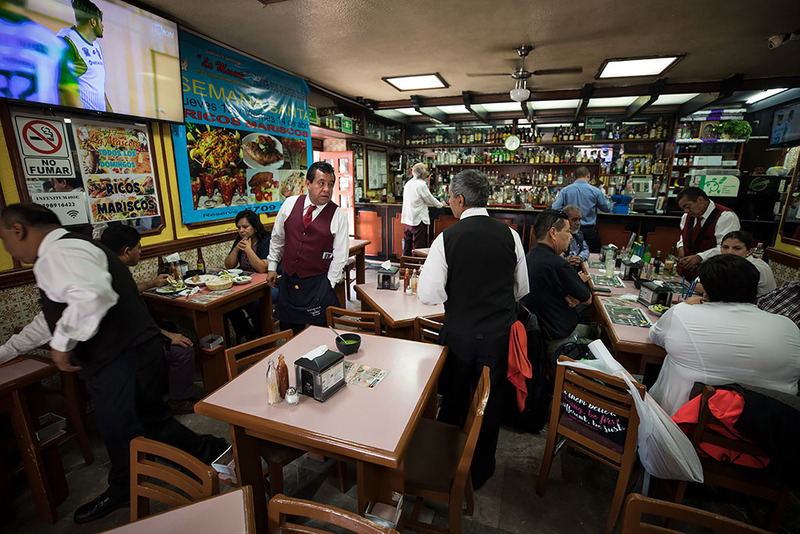 Restaurante Oaxaca en Mexico specialised in food from the Mexican State of Oaxaca (pronounced Wa-ha-ka). 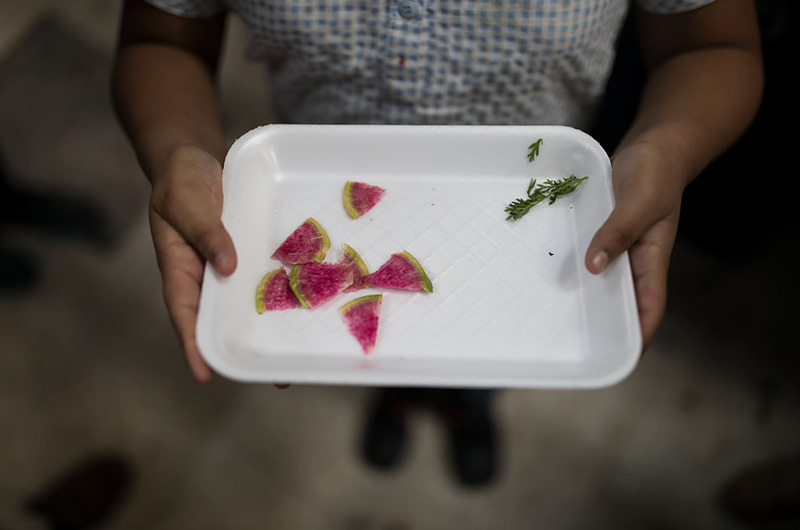 Our first tasting of the day was an enmolada filled with shredded chicken and covered with mole sauce and served with rice. 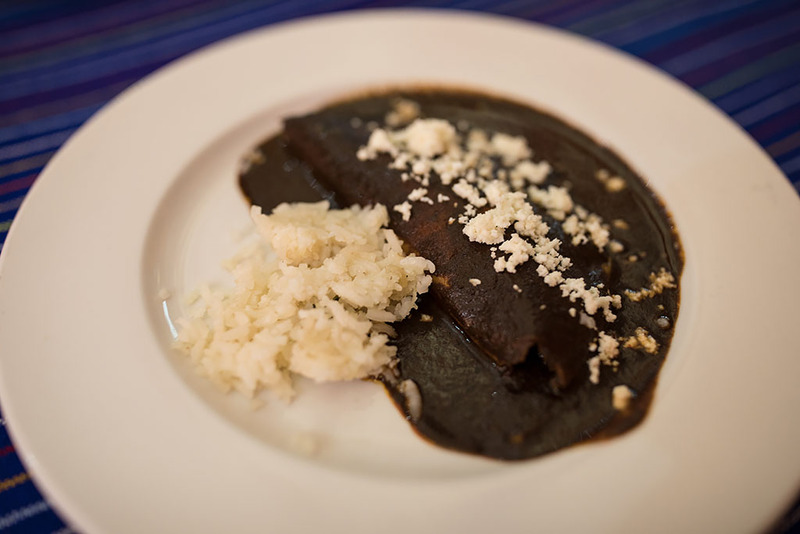 One of the (many) ingredients of the mole was chocolate and made for a very interesting flavour along with the chillies, garlic and other ingredients. 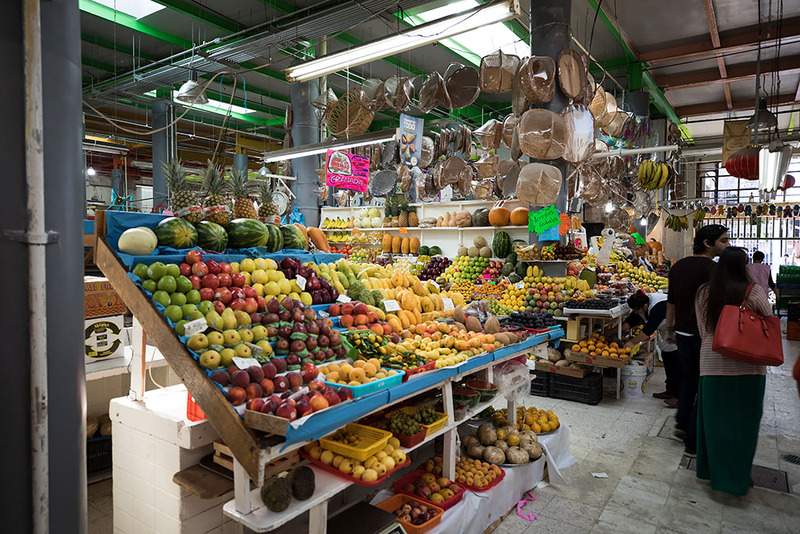 We then went for a walk down the street and stopped near Mercado de San Juan, which I had visited briefly the day before, and Carina went through some of the history of the area with us. 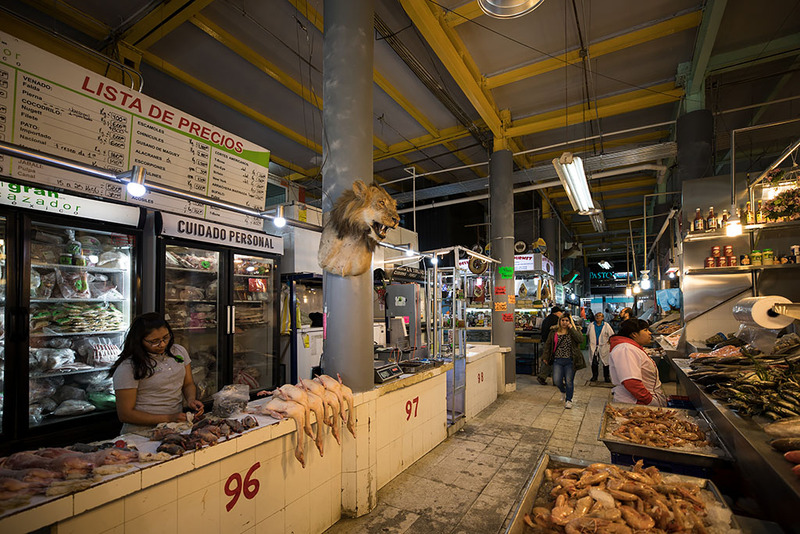 And inside the market, which specializes in gourmet and exotic foods, including fresh meat from iguanas, skunks and even farmed lions! 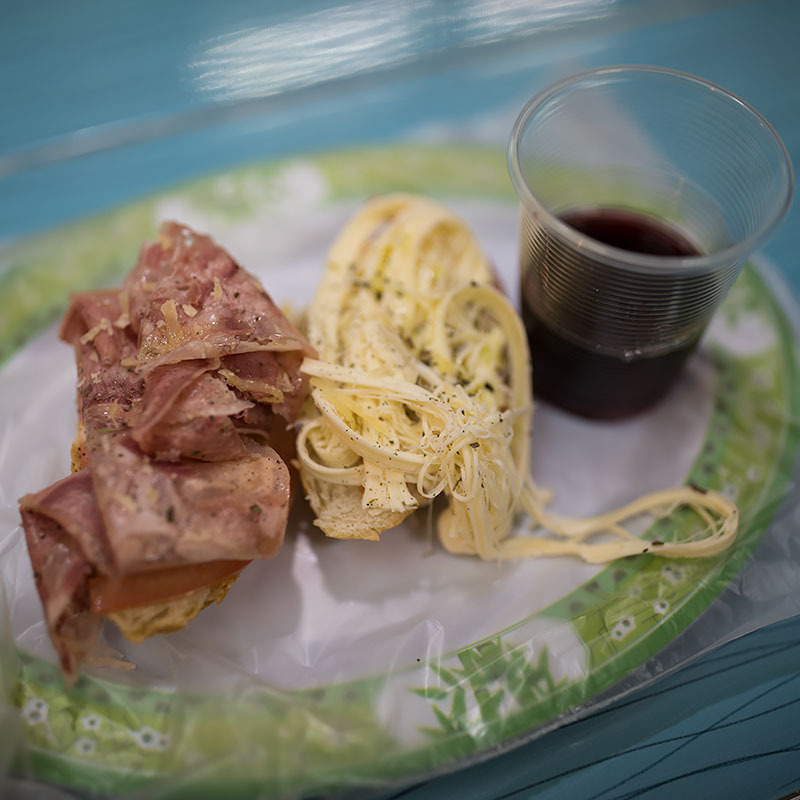 And our second tasting of the day, some very flavourful Queso de puerco made with tongue with Oaxacan cheese and some Spanish red wine at Delicatesen La Jersey Gourmet. 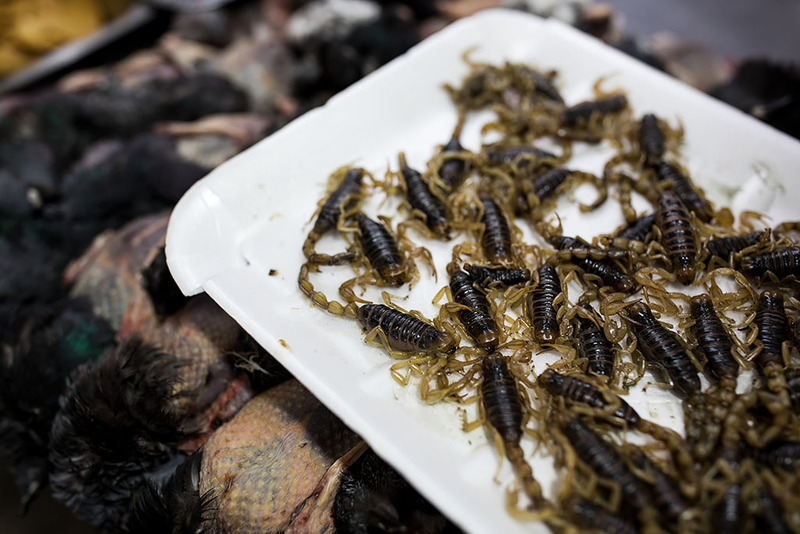 Our next stop was to sample some of the more interesting delicacies in the market. 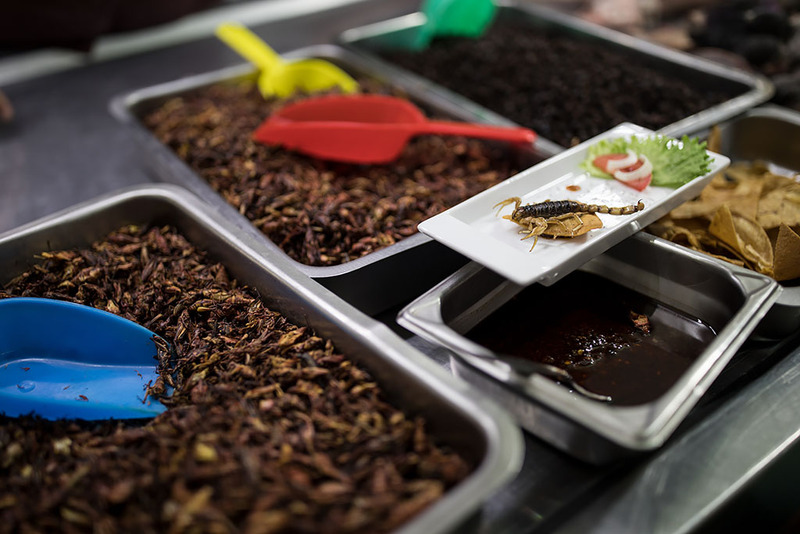 Chapulines (grasshoppers), hormigas (ants) and alacránes (scorpions)! 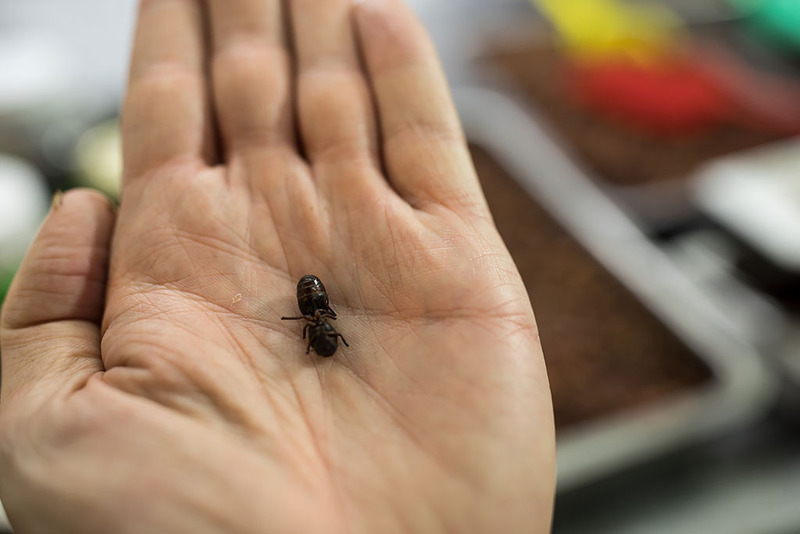 Sampling an ant first. Fried in garlic so actually not too bad. 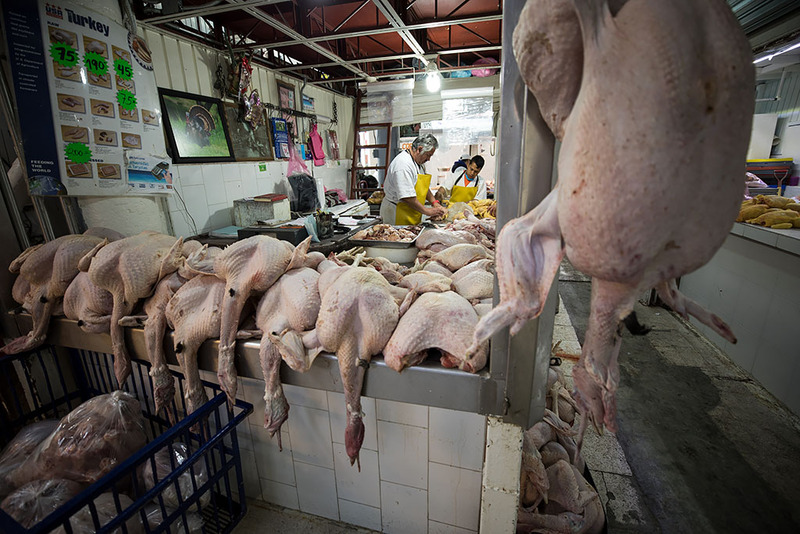 At 2000 pesos or ~$100 a kg, a not particularly cheap source of protein either! 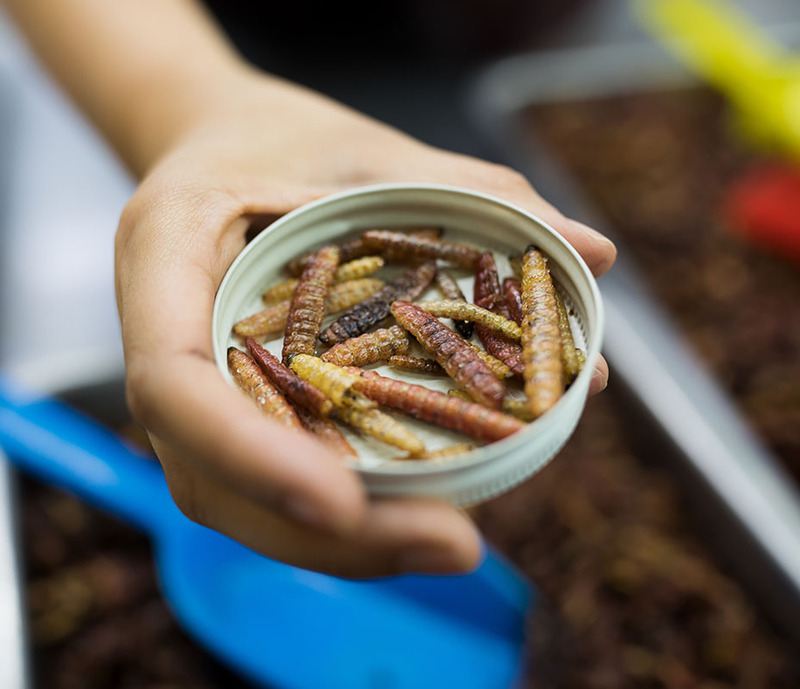 Next were dried maguey worms, or also known as chilocuiles, chinicuiles or tecoles. And finally alacránes, enough to give you nightmares! 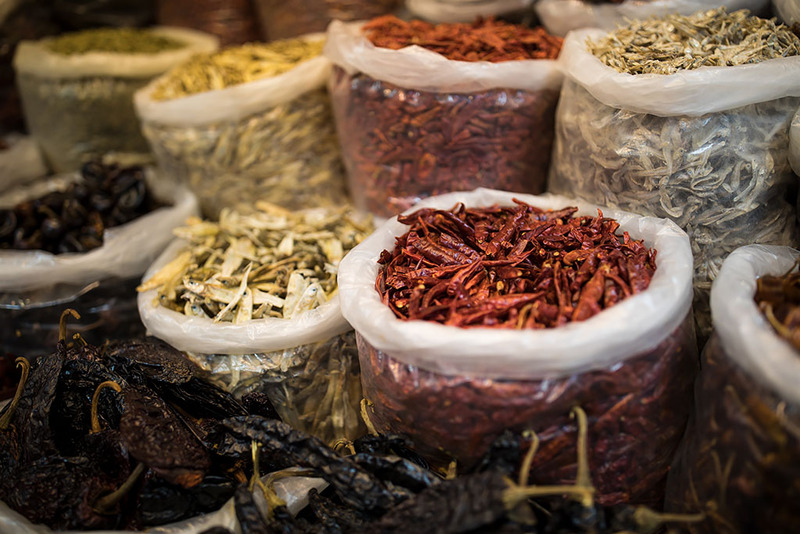 Yellow, red and green peppers. 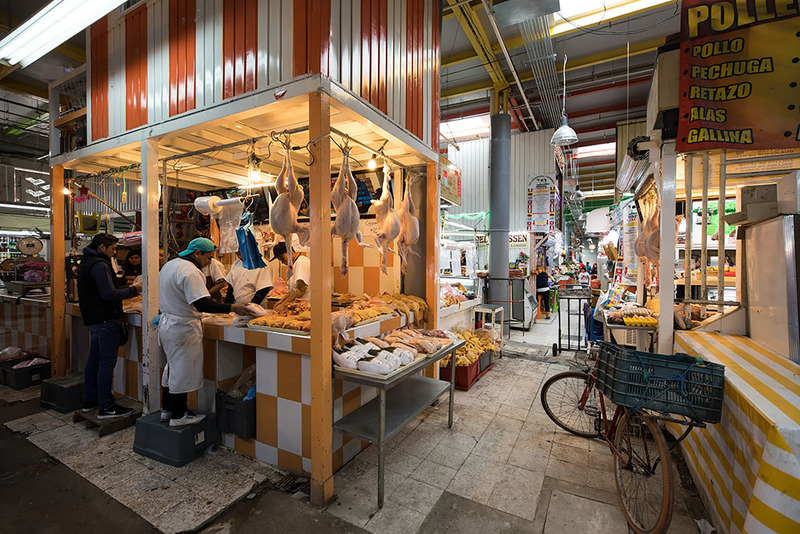 Our food tour continued in Mercado de San Juan to El Gran Cazador. 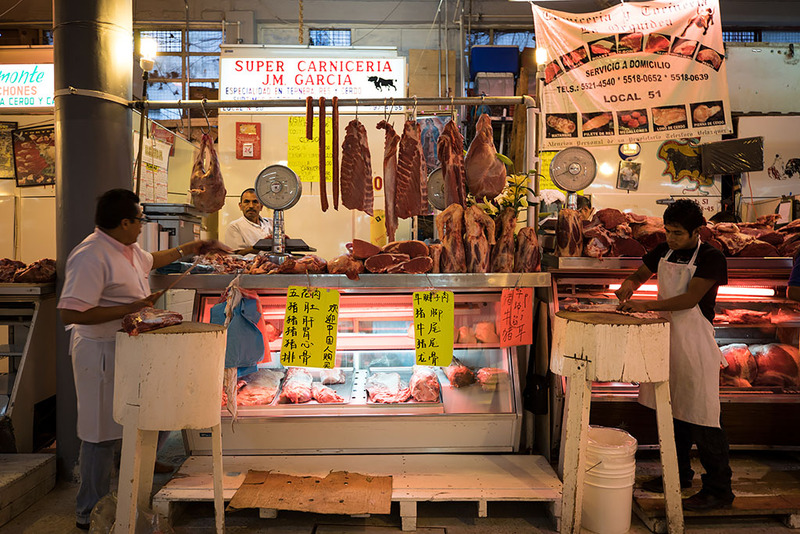 El Gran Cazador specialised in pre-Hispanic foods and exotic meats. 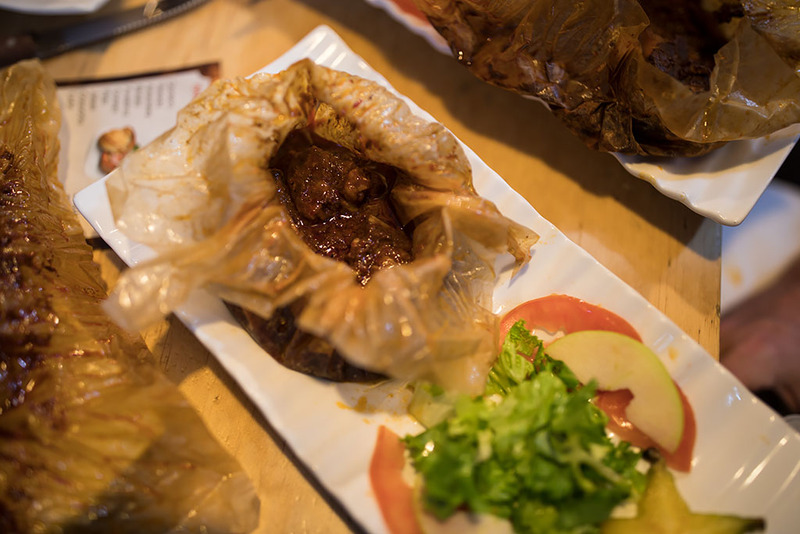 We were then served some mixiote, a dish that consists of seasoned meat that is then wrapped and cooked in the semi-transparent outer skin of the leaves of the maguey or century plant. Our mixiote contained a stewed mysterious meat and Carina gave us a list of possible animals while we were all eating away. Someone finally guessed the right answer; wild boar. Quite tasty, extremely tender and very delicious. 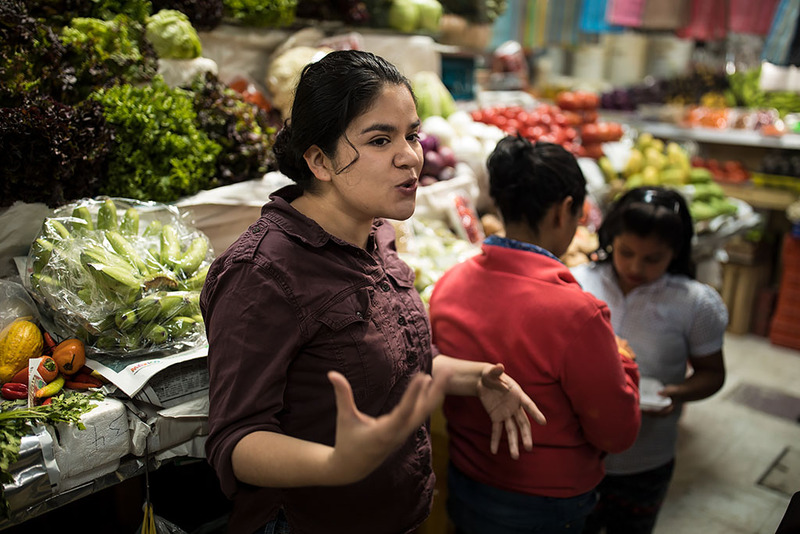 At our final stop in Mercado de San Juan, Rosse Gourmet, that specialised in edible organic flowers, herbs, roots and vegetables. 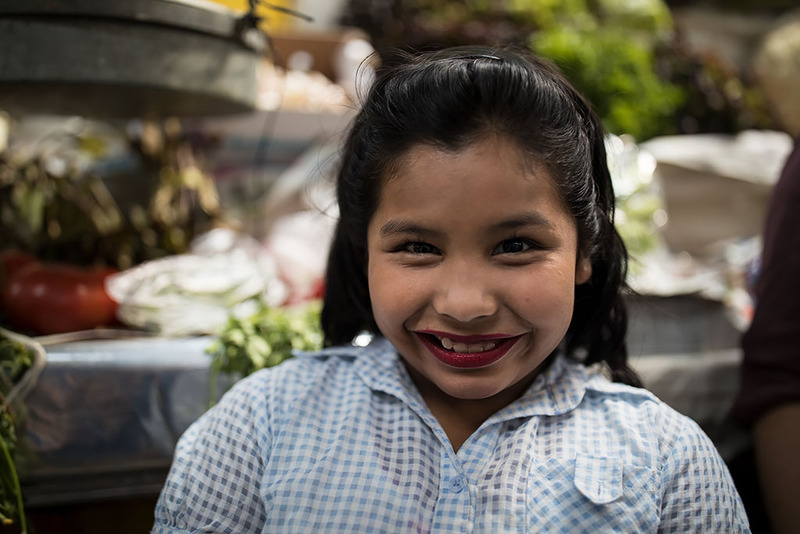 Kim, the proprietors daughter, was helping her mum during the weekend and offered us a variety of different flowers and fresh herbs to taste. 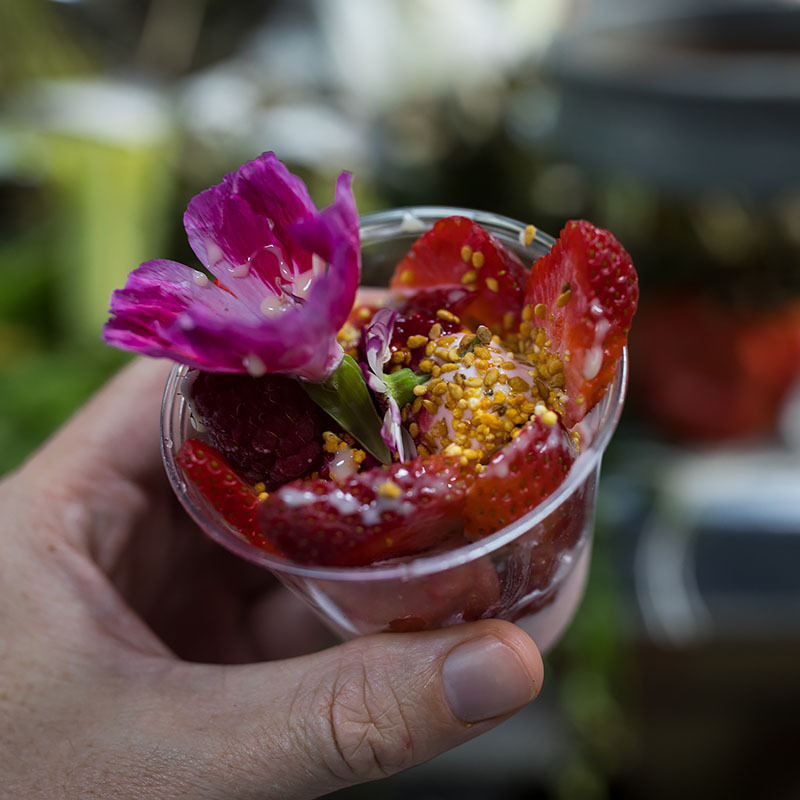 To finish we were each were treated to a cup of fresh strawberries, raspberries and ice cream. And a big smile from Kim as we said farewell and headed on to our next culinary experience. 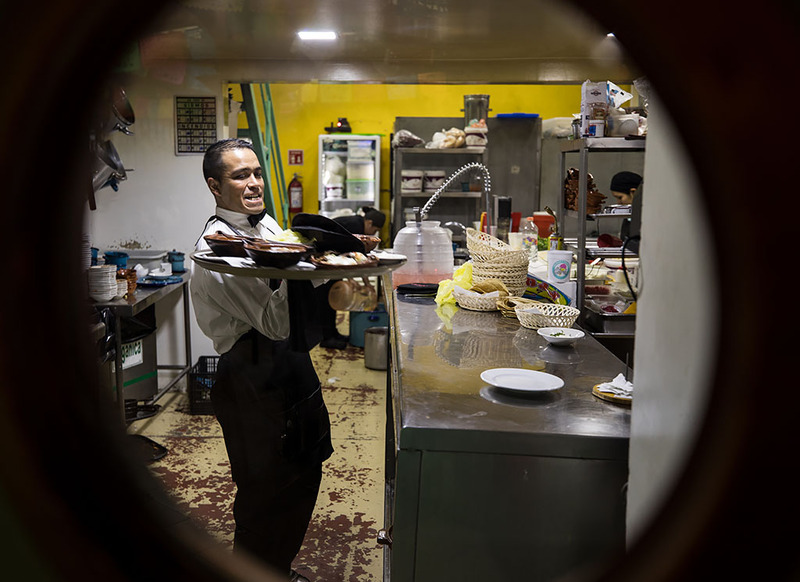 We headed out of the market and headed east along Ayuntamiento Street for a fix of Mexican street food at El Caguamo. 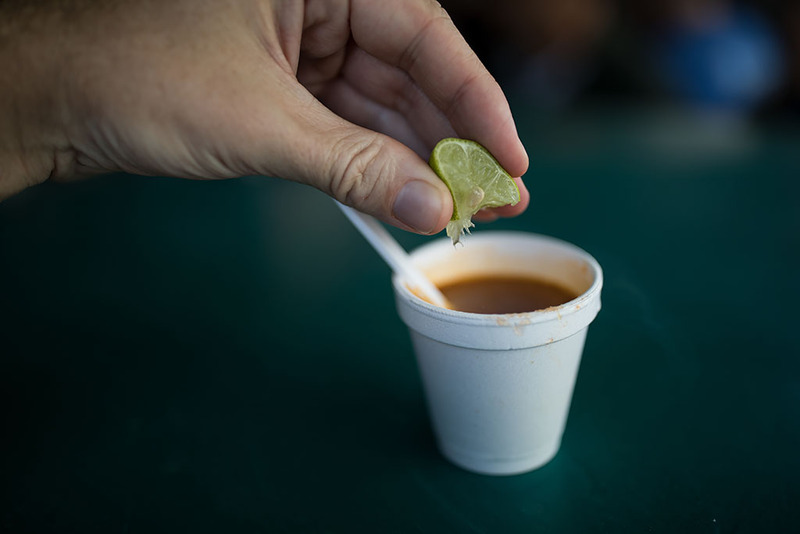 Adding some lime to seafood soup to start. 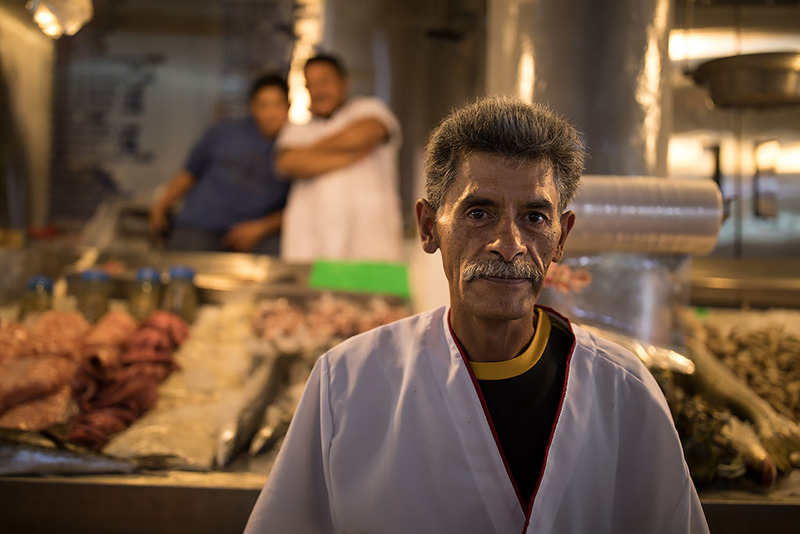 For almosy 40 years the Tamariz family has been selling tasty shellfish and seafood at El Caguamo from the sidewalk of Ayuntamiento Street. 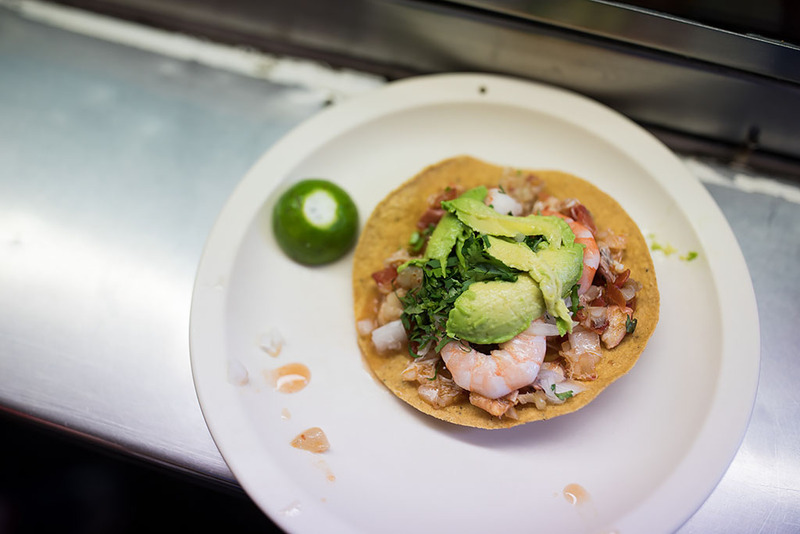 The very tasty cerviche tostada and console de camaron, a prawn ceviche served on top of a crunchy tostada with onion, lime juice and avocado. It certainly tasted as good as it looked! 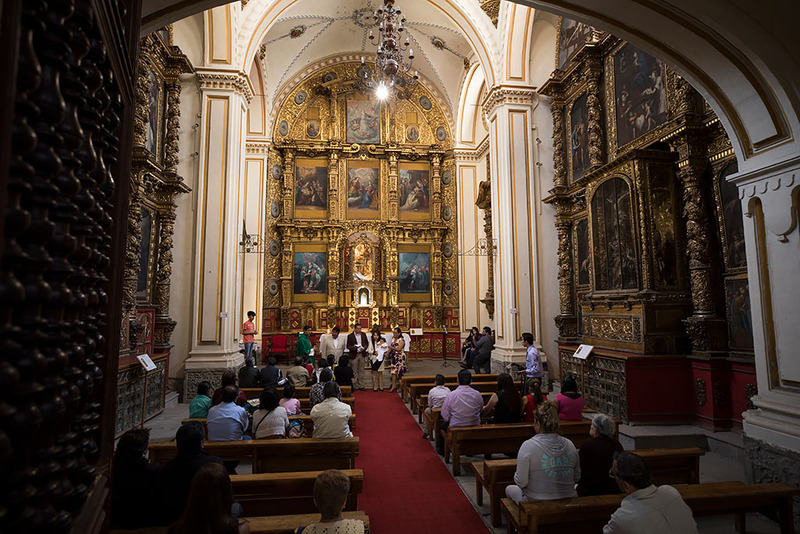 After the mouthwatering seafood, we headed to Iglesia de Nuestra Señora de Guadalupe (Church of Our Lady of Guadalupe) where a baptism was underway. 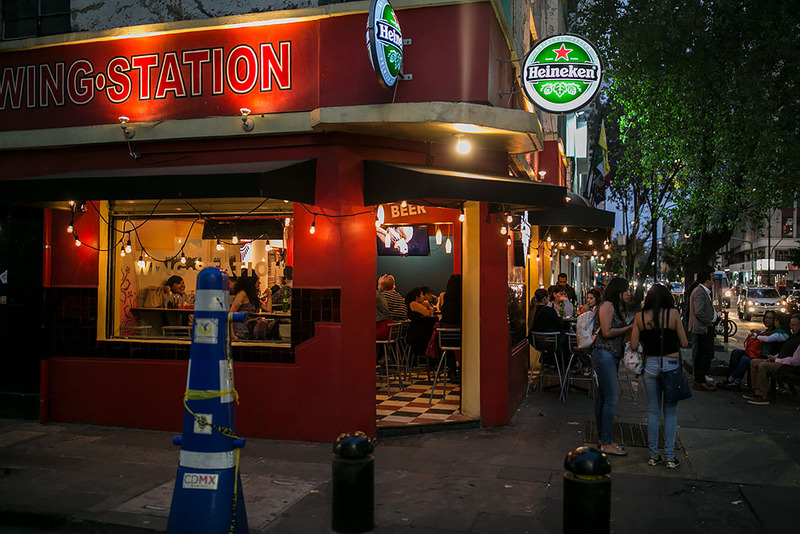 Our next stop on the tour, at Cantina La Mascota, a bar in Centro Histórico that was visited by Anthony Bourdain on No Reservations. 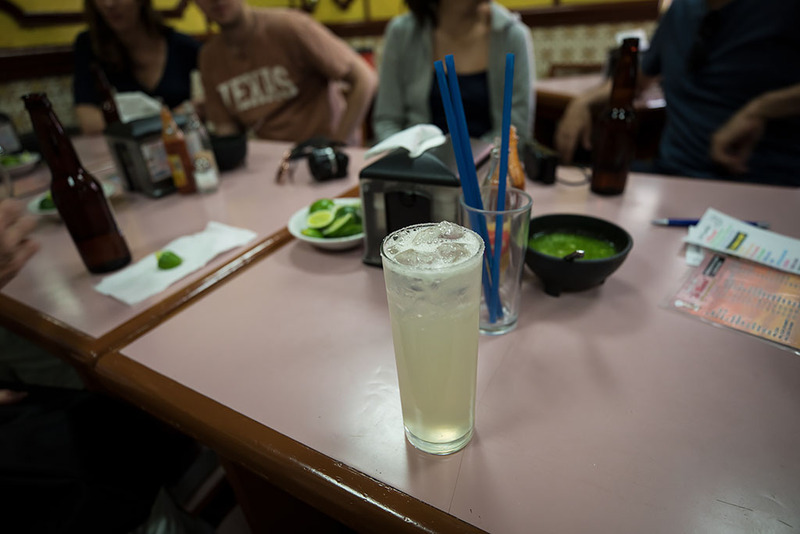 We were entitled to one drink as part of the tour, so I opted for a margarita made with 100 Anos tequila. 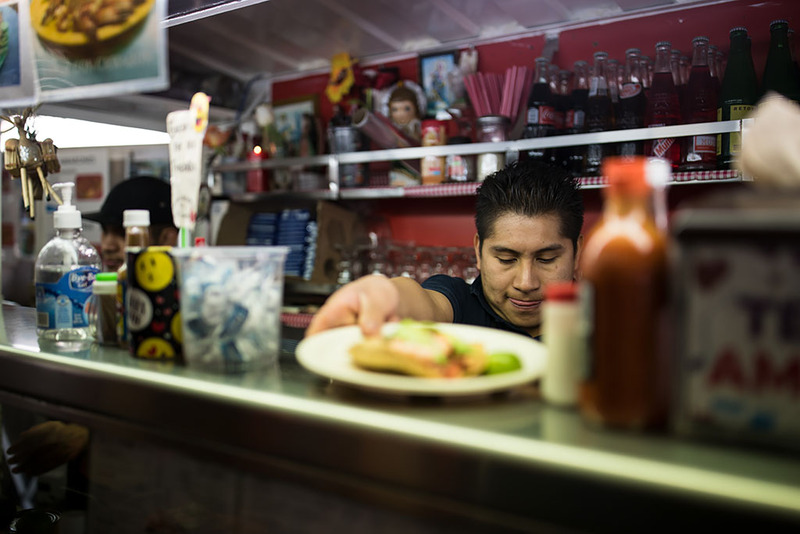 The great thing about Cantina La Mascota was that as long as you were imbibing, all the food was for free! 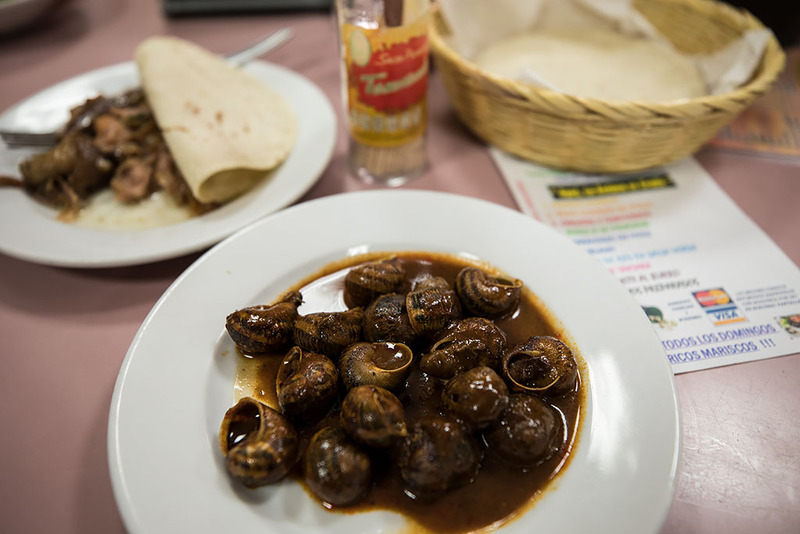 I opted for the Tortilla de cerdo and some juicy caracoles (snails). A roving musician playing for us for only 20 pesos / $1 a song. 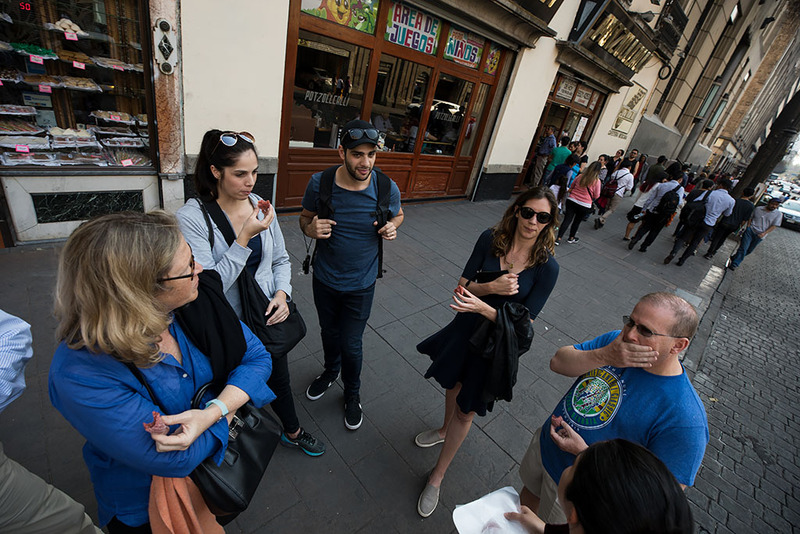 After the great atmosphere, drinks and food at Cantina La Mascota we headed out again to continue our walk through Centro Histórico. Walking along the cobbled streets. 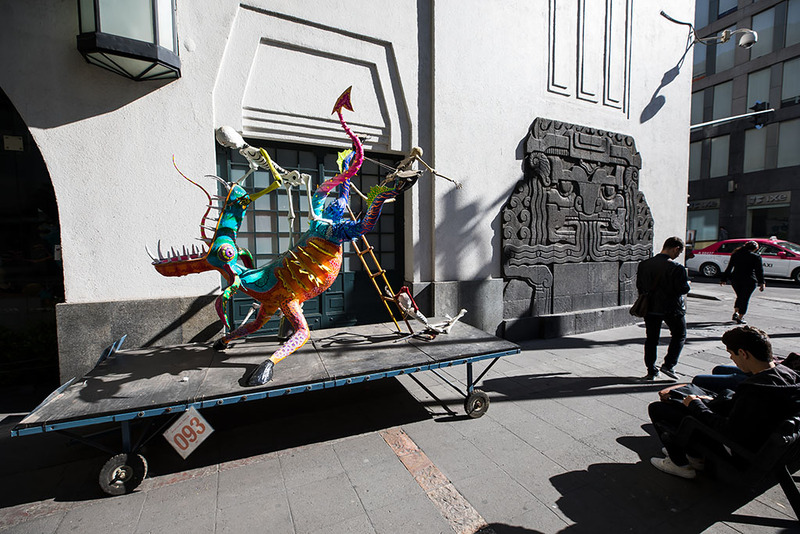 In the lobby of Gran Hotel Ciudad de México, situated in the Old Portal de Mercaderes and next to the Zócalo. 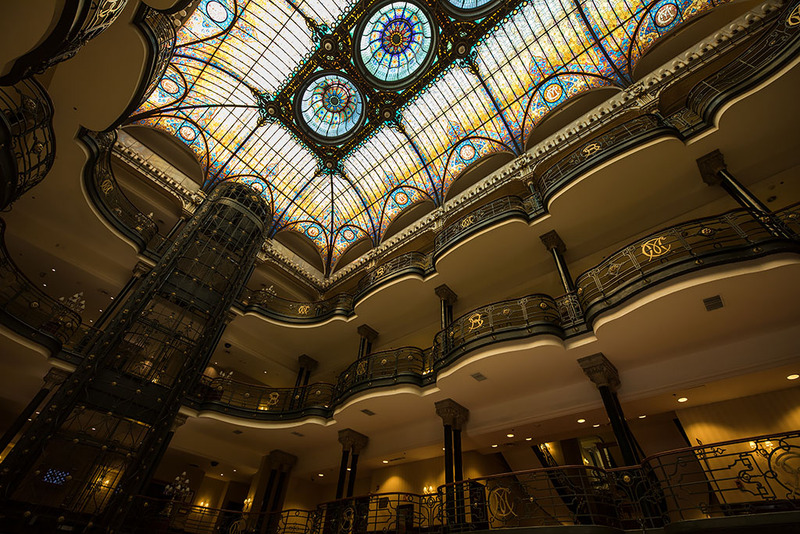 Originally a department store that was built in 1899, it was later converted into a hotel. 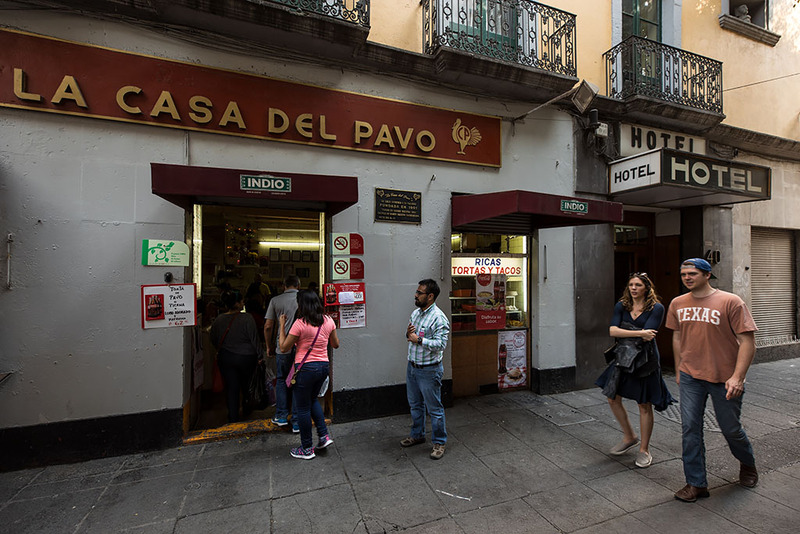 Walking past La Casa del Pavo (the House of Turkey), famous for its pulled turkey tortas. At our second to last stop of the tour, at La Bipo Pasagüero, a contemporary cantina in Centro Histórico. 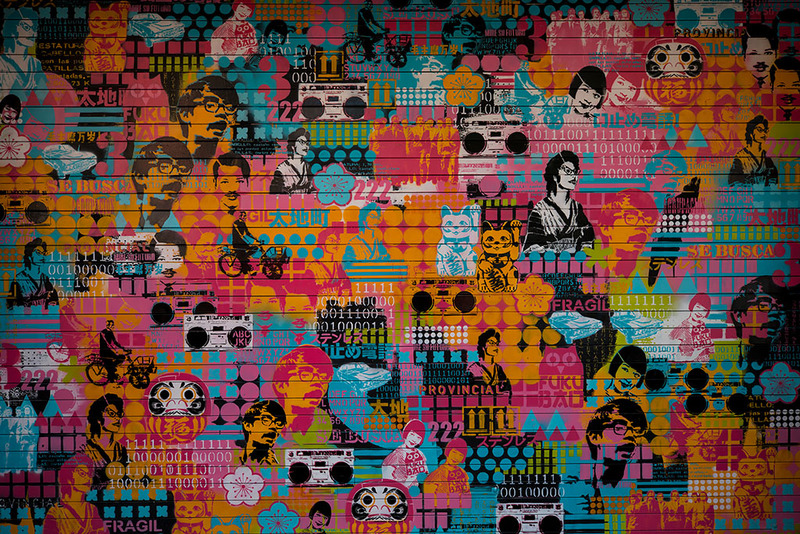 Quite a modern and hip joint specialising in exquisite modern Mexican food. 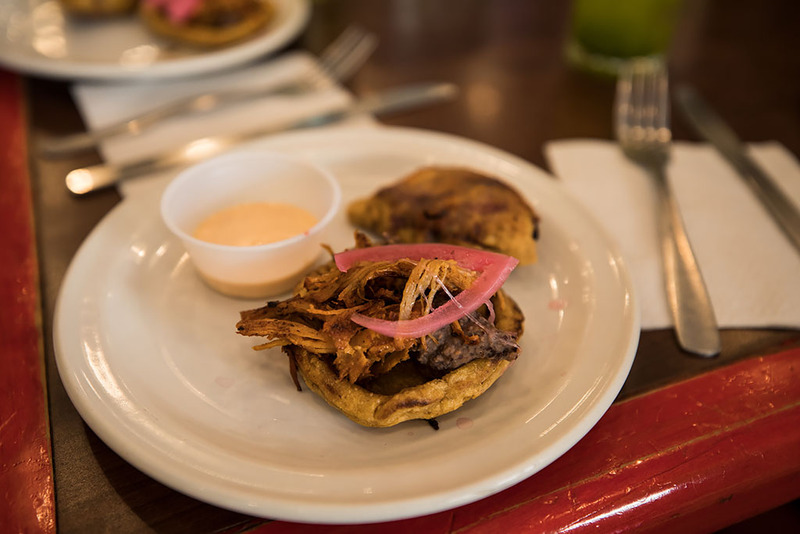 And about to enjoy the Quesadilla de Jamaica y some de cochinita pibil. 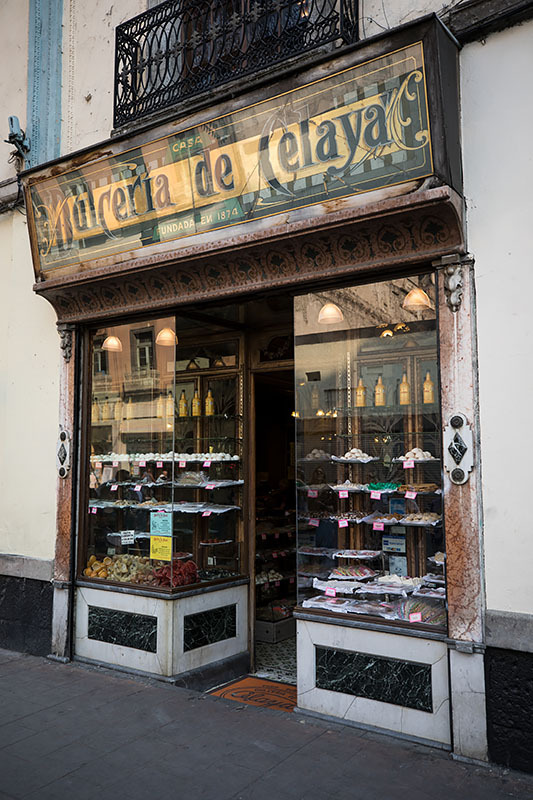 Dulcería de Celaya is a 140 year old family-owned sweets shop near the Zócalo. 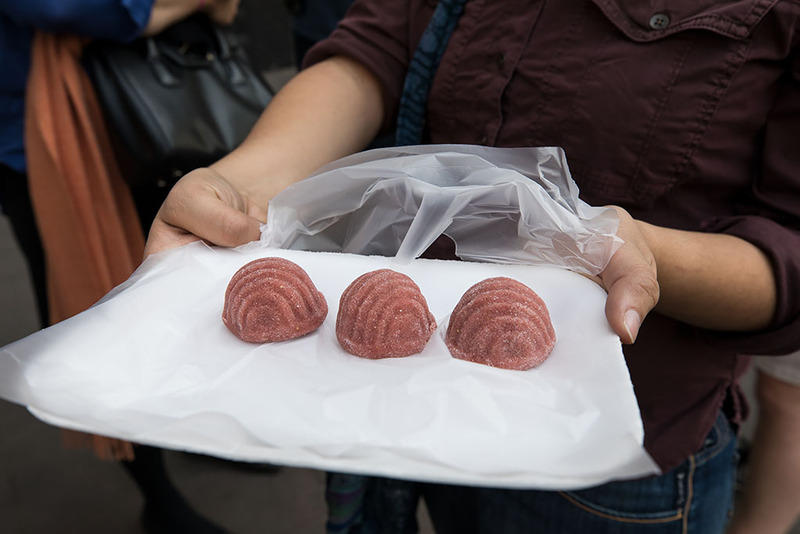 And the sweet end to our food tour, the Picon de fresa, a strawberry flavoured sugary dumpling. 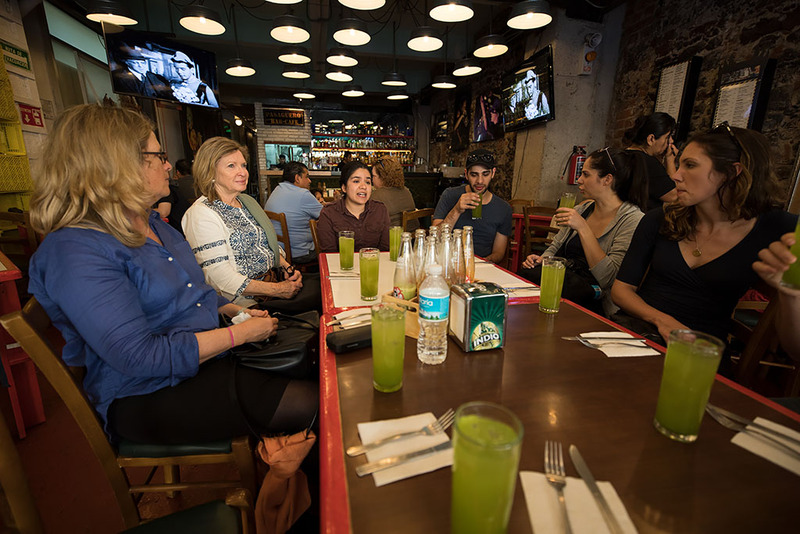 A great finish to the just over five hour food tour through Centro Histórico and we definitely didn't go hungry! I said farewell and thanked Carina for the amazing Mexican culinary extravaganza. 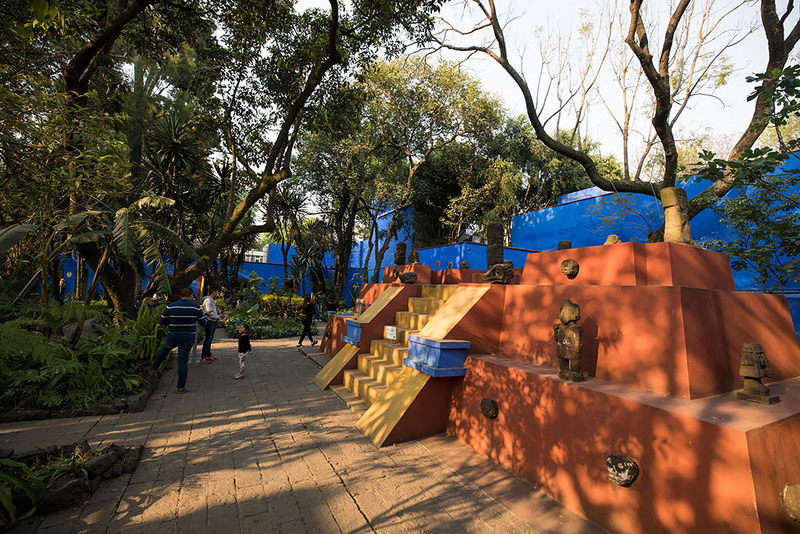 I then made haste to the nearest metro station to try and get to the Frida Kahlo Museum in Coyoacán before it closed for the day. Outside the museum after speed walking the one mile walk from the metro station. I had gotten there at 4:45pm and there was still a long queue down the street. I had bought my ticket online though so could skip the queue and make it inside before they closed admittance for the day. 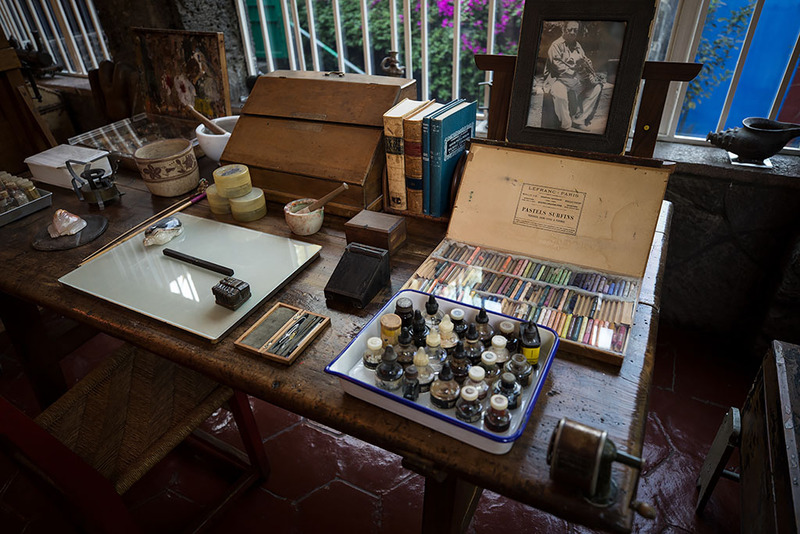 The museum is set in the former residence of Frida Kahlo and her husband, Diego Rivera. 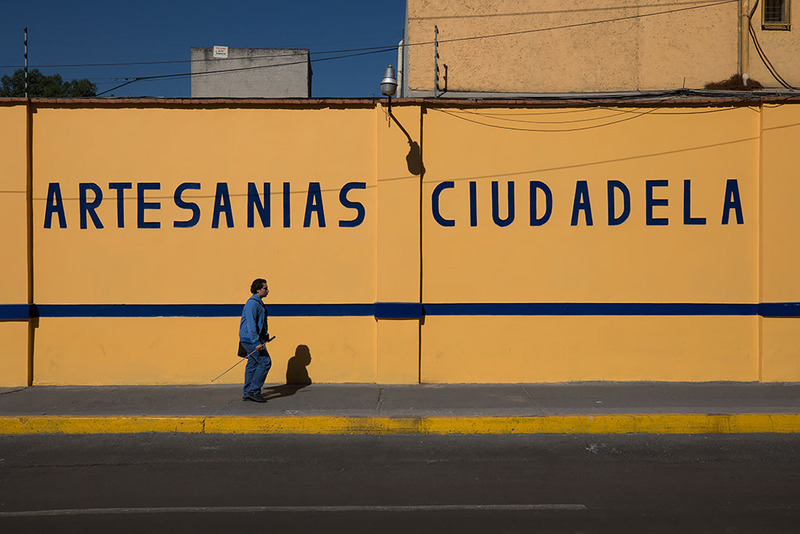 It is also known as the Blue House (La Casa Azul) for the cobalt-blue walls. 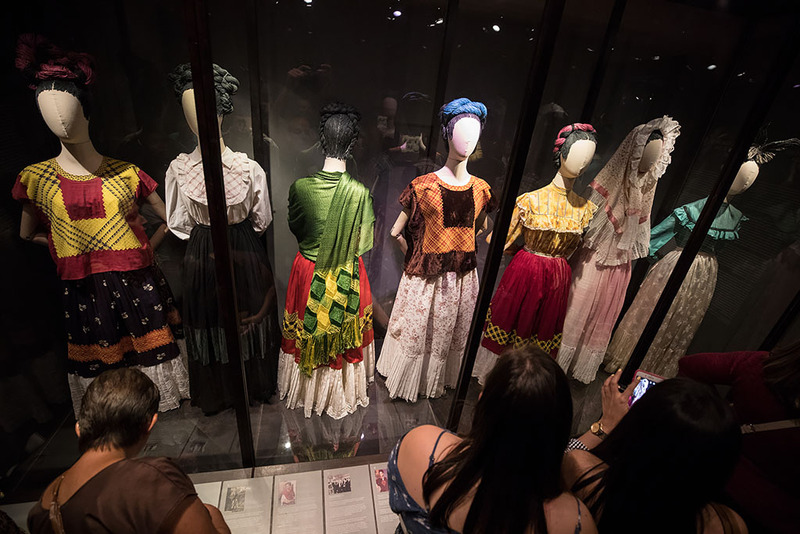 Some of Frida's dresses on display. Her husband, Diego Rivera, insisted that she not wear Western clothing as he believed that Mexican women should only wear Mexican dresses. 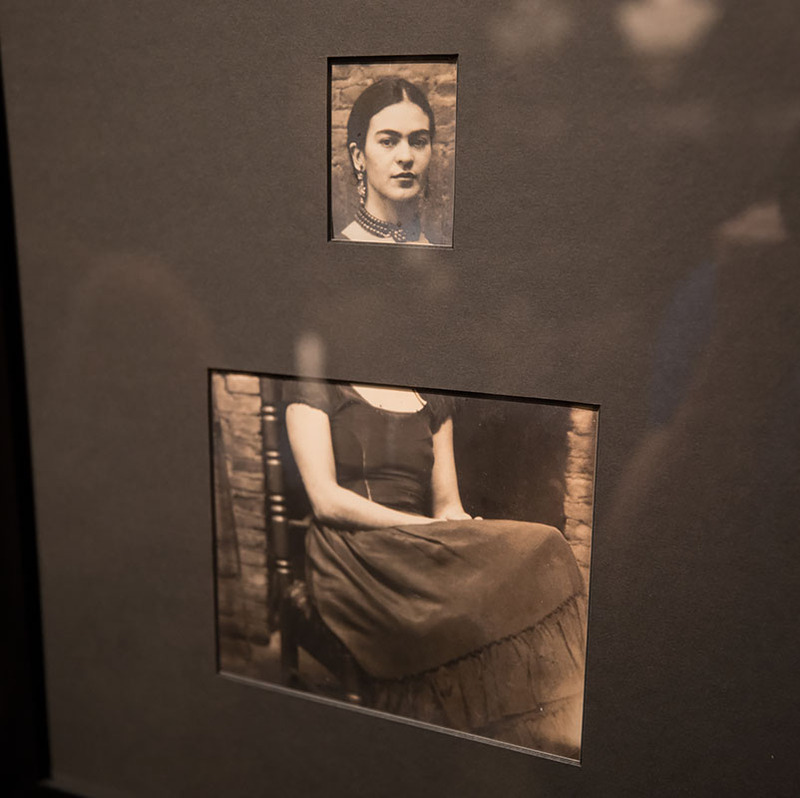 In September 1925 at the age of 18, a bus that Frida was riding on collided with a streetcar. An iron handrail impaled through her pelvis, fracturing the bone. She also fractured several ribs, her legs, her collarbone and displaced three vertebrae. The near fatal accident caused her great pain and illness for the rest of her life. 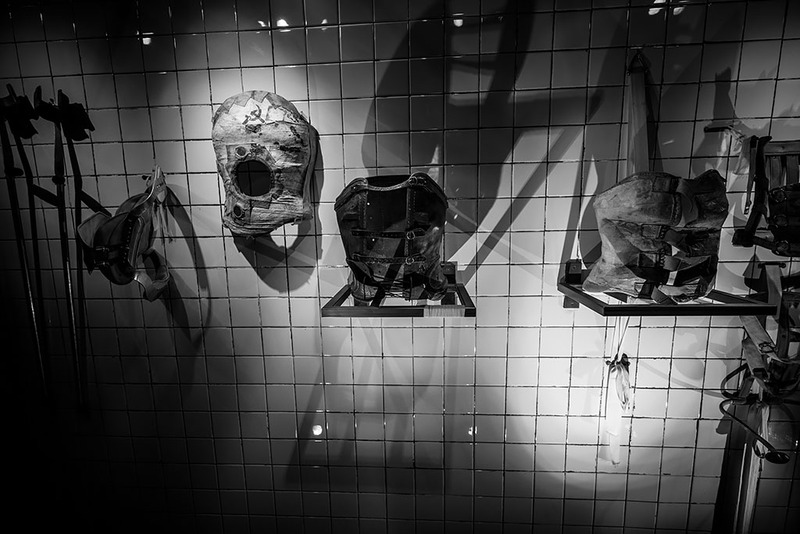 Some of the her corsets on display she had to wear due to her spinal problems. They varied from steel and leather to plaster. 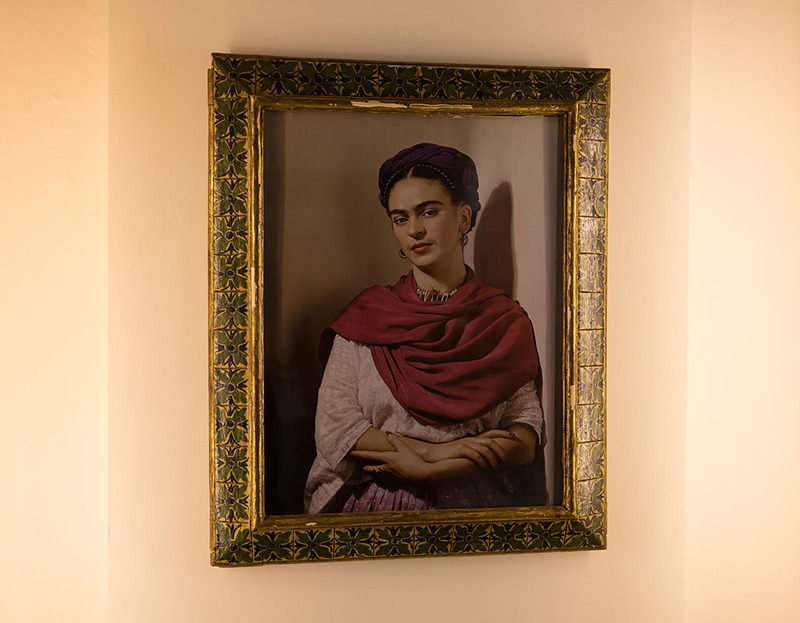 Frida collected over 6,000 photographs and she would show her affection by inscribing them, clipping out figures or even defacing them. She also used some of them as references in her own artwork. 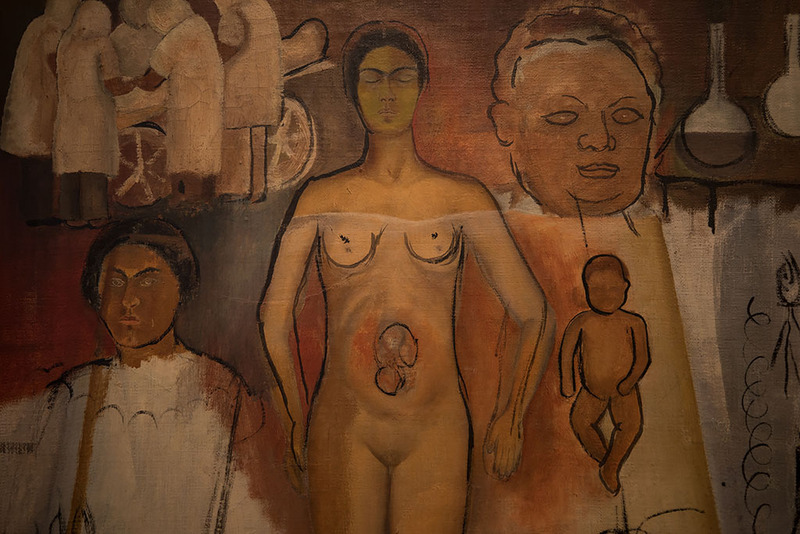 Many of Frida's paintings focused on anatomy and her own infertility. 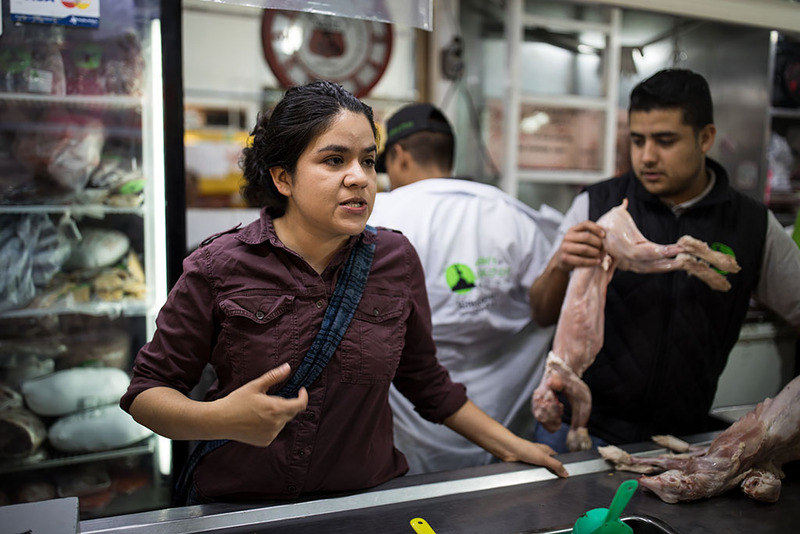 As several of Kahlo’s internal organs, including her uterus, were severely damaged during the bus accident, Kahlo had several miscarriages and underwent therapeutic abortions. Frida and Photography. 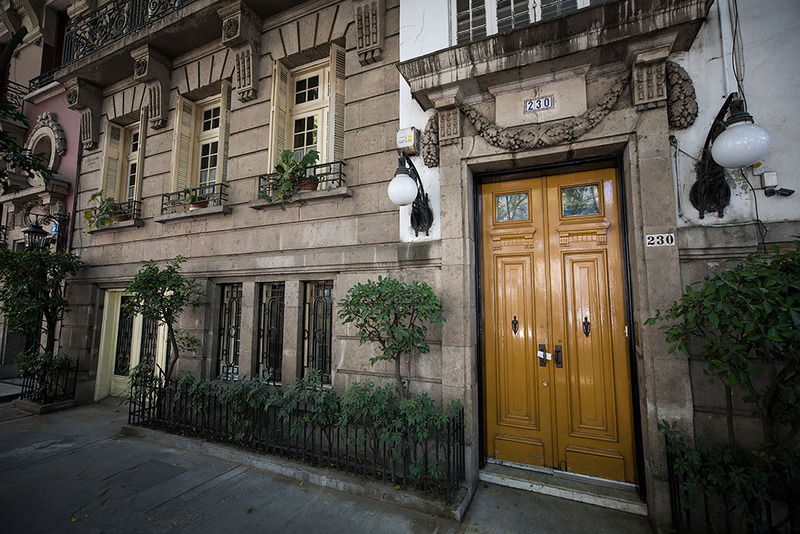 Frida's father was an official government photographer of Mexican architecture and monuments. 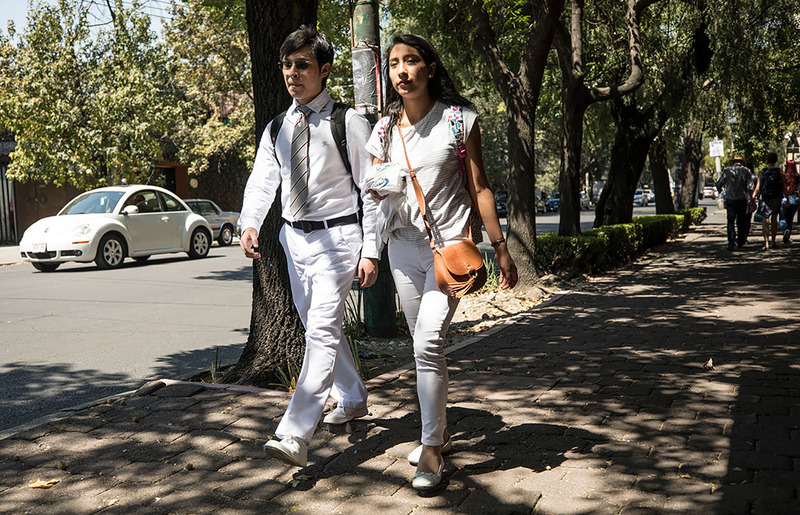 Because he suffered from epilepsy, Frida would accompany him in the darkroom as a girl to help out as necessary. 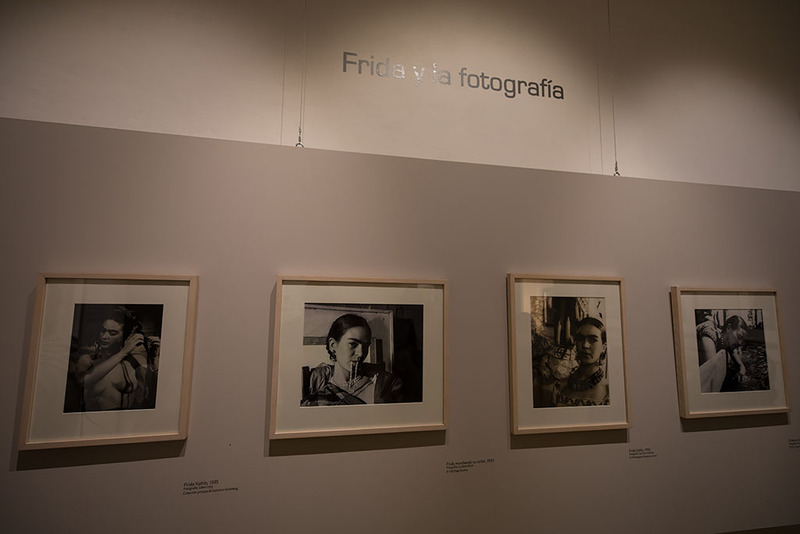 Understanding the artistic value of photography, Frida learned from an early age how to pose for the camera and made photography a part of her life and artistic legacy. 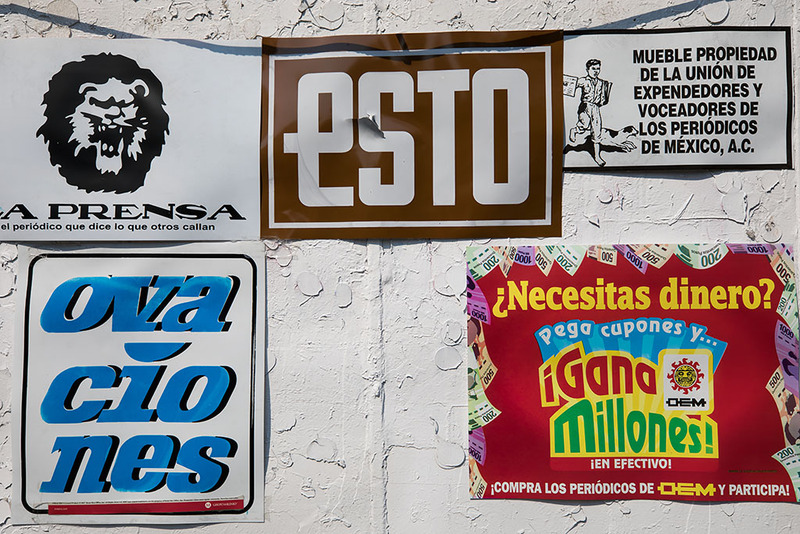 Some of her paints in La Casa Azul. 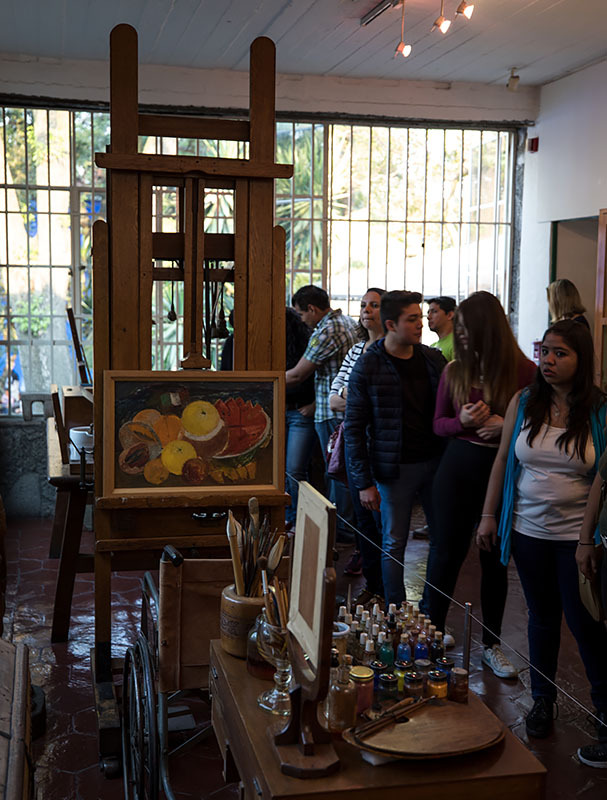 Frida's wheelchair and easel that was given to her by Nelson Rockefeller, and one of her still life paintings from her final years. 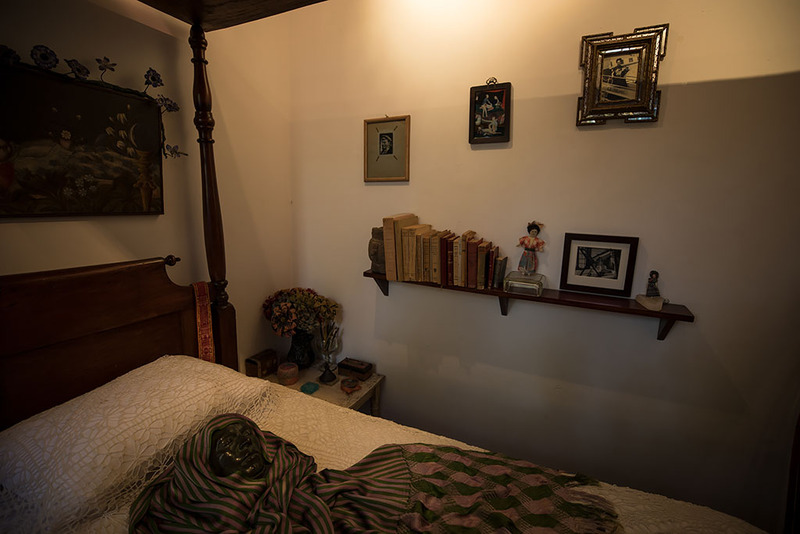 Frida's death mask lying on her bed. 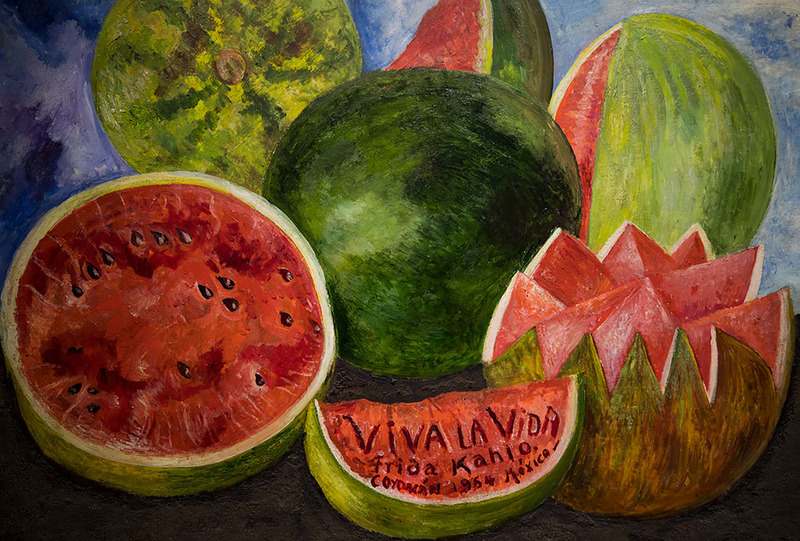 On the night of July 12, 1954, Frida passed away after overdosing on painkillers. 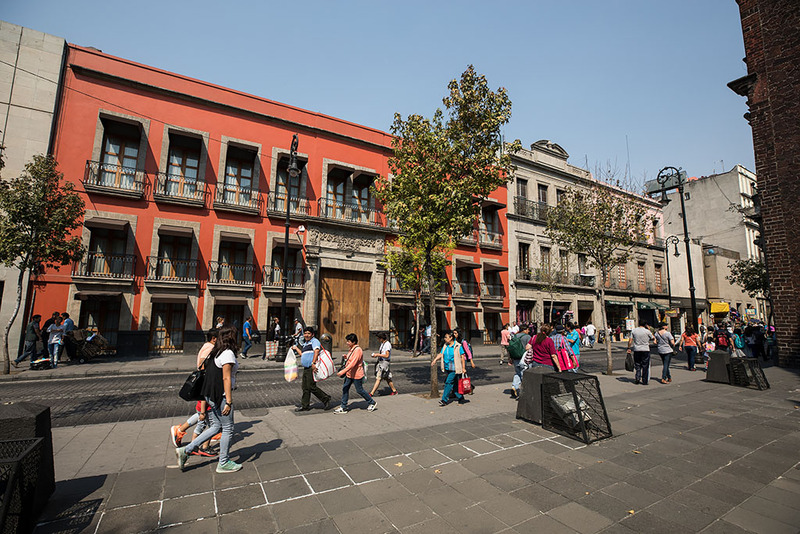 After the very interesting and insightful visit to La Casa Azul, I walked through the tree-lined streets of Coyoacán. I was still quite full from the food tour, so opted for a churro from Churrería de Coyoacán as an evening snack instead of dinner. 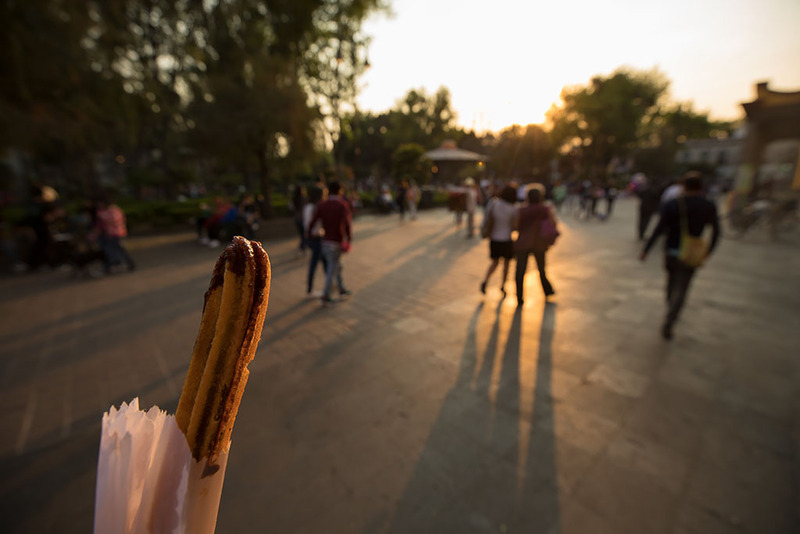 I then walked down to Plaza Hidalgo with my hot churro to enjoy the spring weekend evening with the locals. 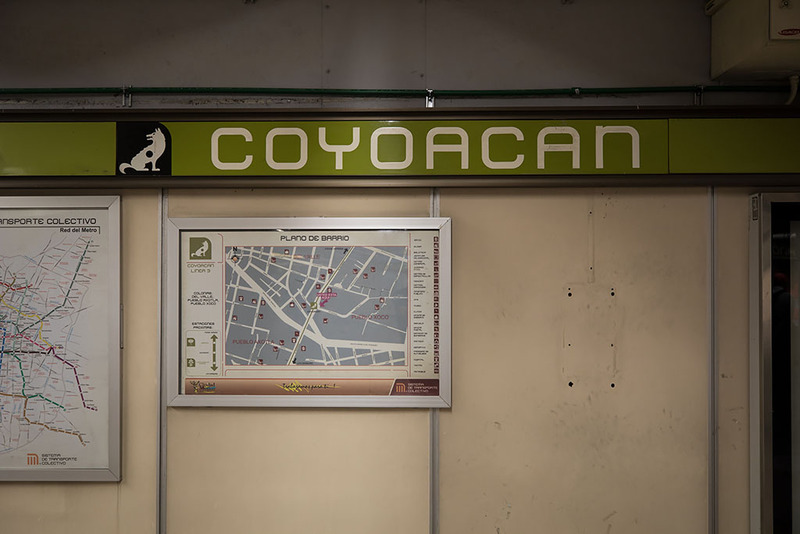 Back at Coyoacán metro station to catch the train ride north. 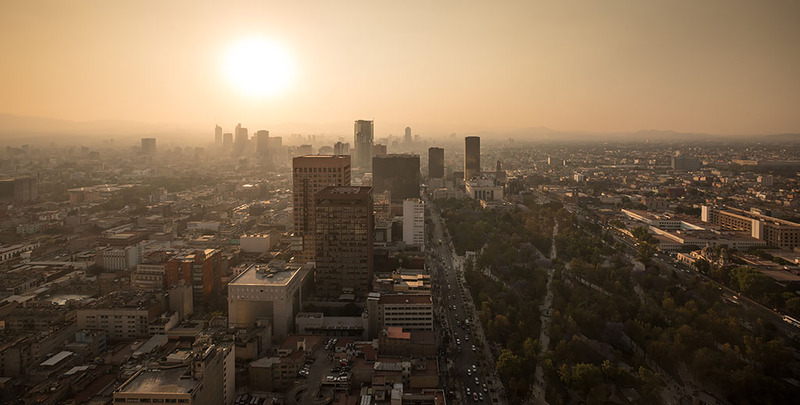 And in the city again at the end of a very enjoyable last day in Mexico City. 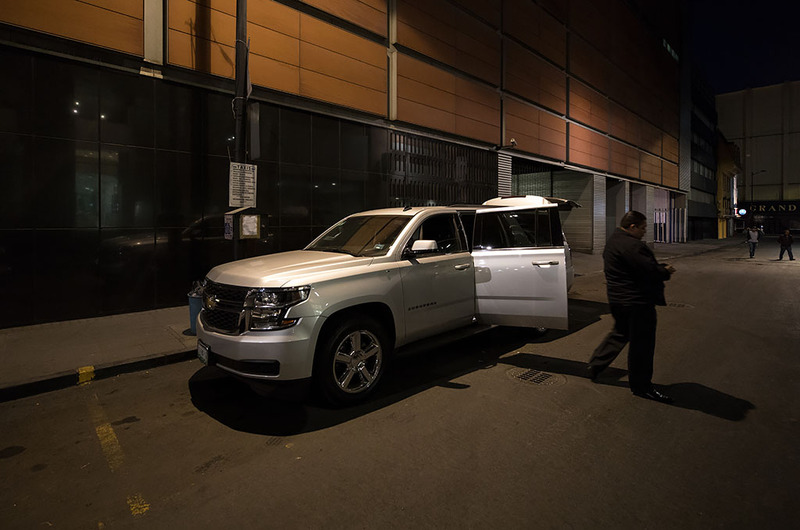 About to catch a ride in the hotel Chevrolet Tahoe at 6am for the ride back to the airport. It was only 280 pesos for the 30 minute ride so very reasoanable. 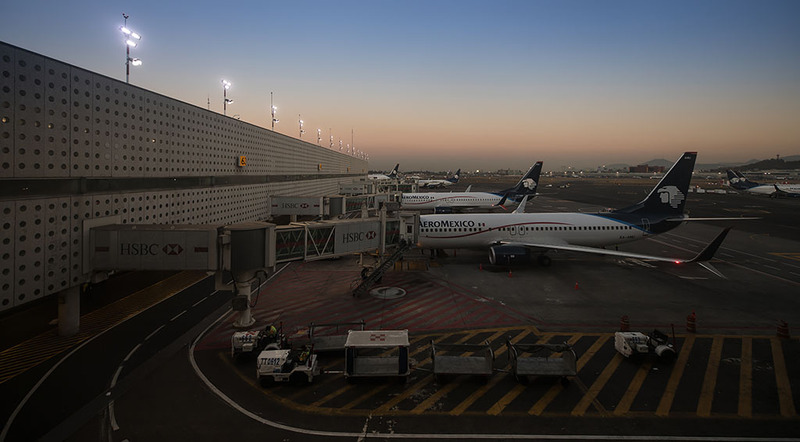 And outside Mexico City International Airport, ready to check in for my 9am flight to Tijuana. 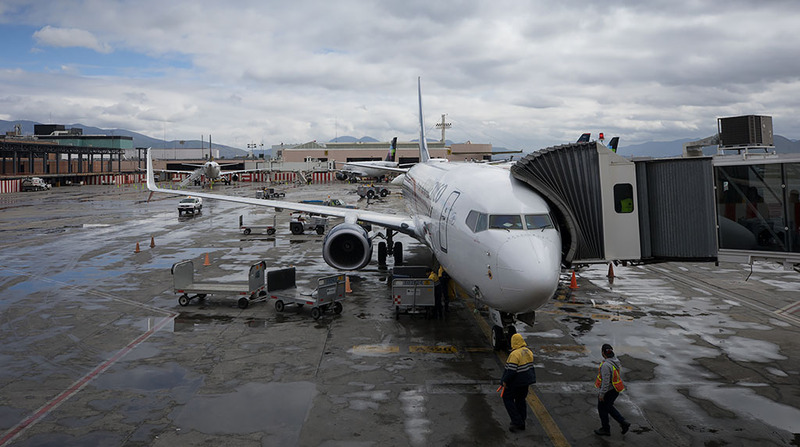 As there were no direct San Diego flights and to avoid having to make a connection in LAX, I instead opted to fly to Tijuana International Airport and then cross over the border to San Diego. After using the check in kiosks to print my boarding pass, I then dropped off my suitcase at the bag drop. Aeroméxico Boeing 737's lined up along the terminal. 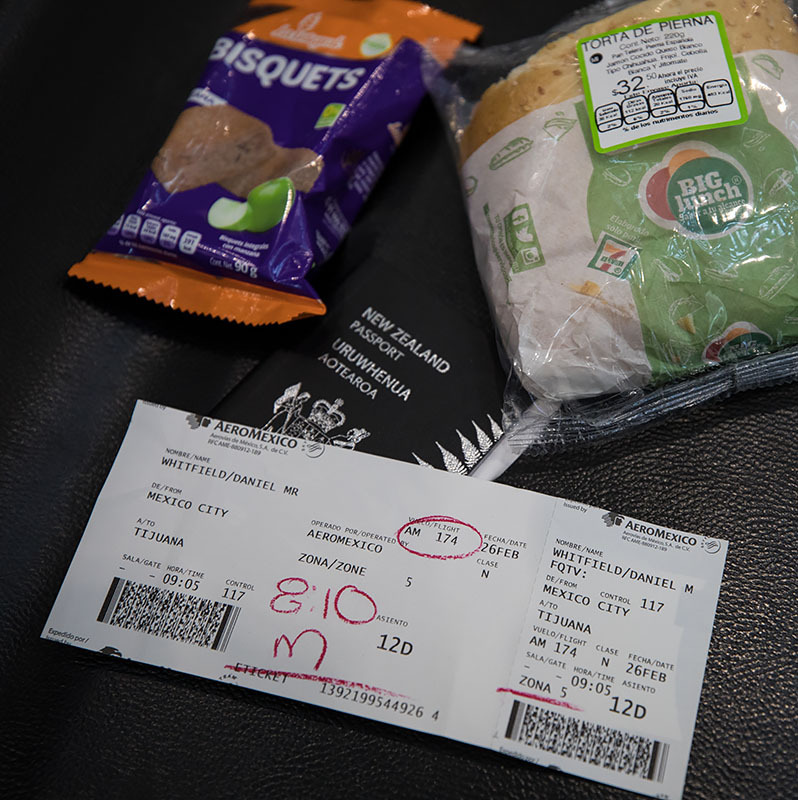 A sandwich and apple cake for breakfast from one of the airport shops. And after boarding ontime for the flight to Tijuana. 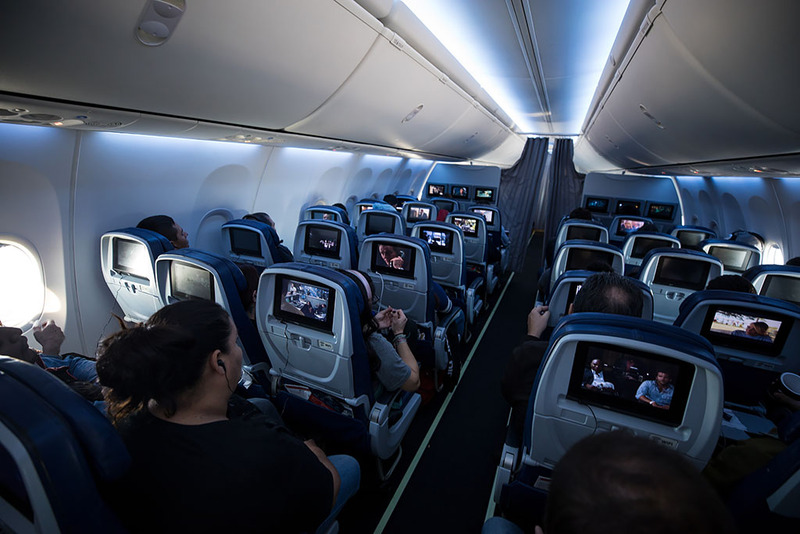 The seats were relatively roomy with IFE also. 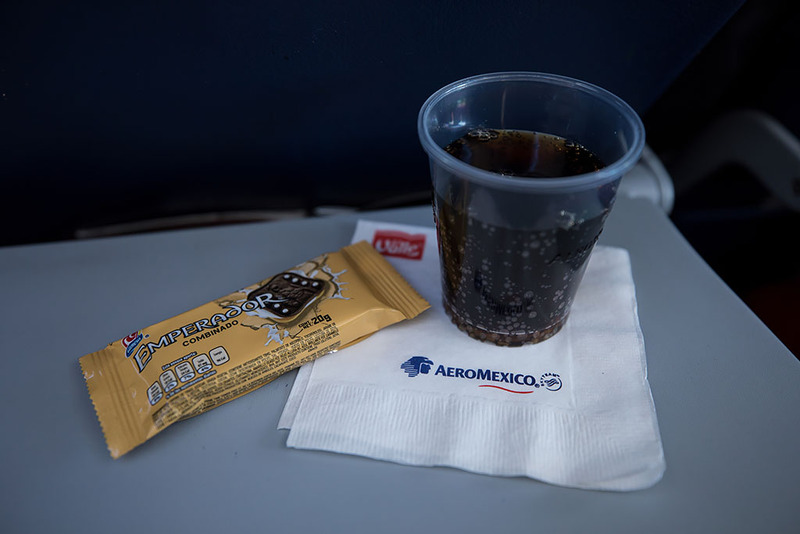 A snack and drink served on the 3.5 hour flight. 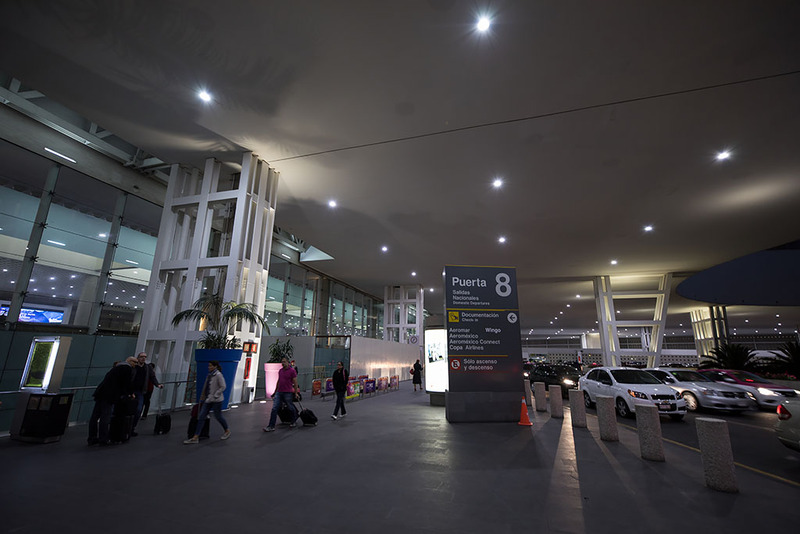 And arriving on time at Tijuana International Airport where there had been a recent shower of rain. Following the signs to the Cross Border Xpress. 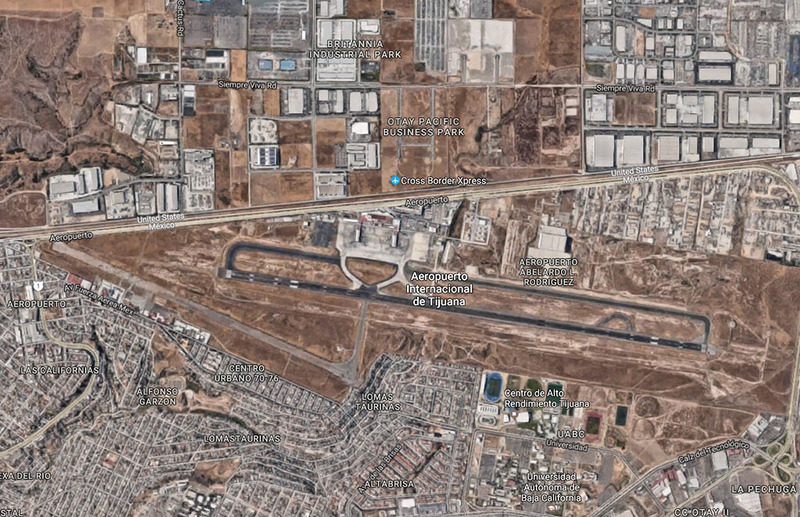 Tijuana Airport is situated right on the Mexican-USA border. 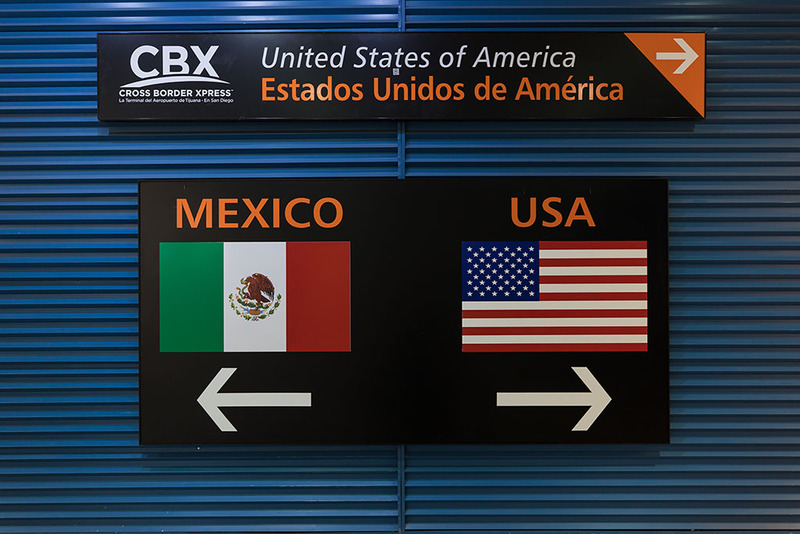 In December 2015 a bridge was opened across the border between the two countries, along with a terminal on the US side of the border connecting to Tijuana Airport. 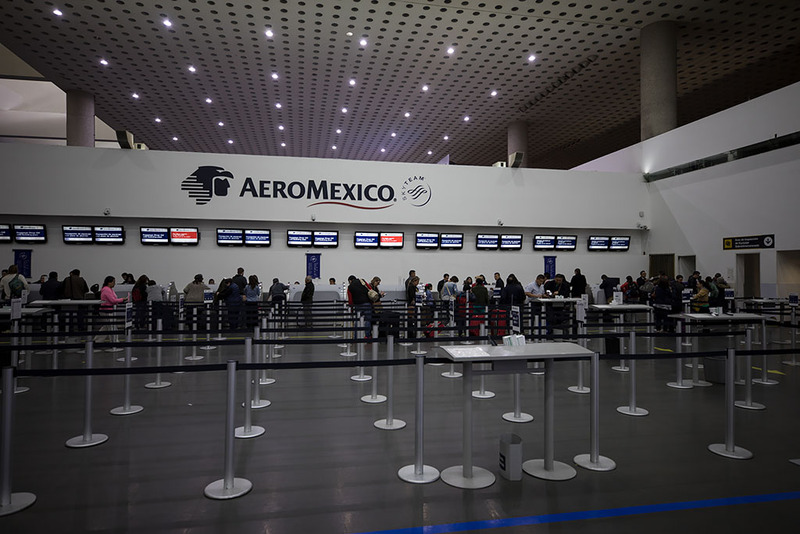 Named the Cross Border Xpress, it allows passengers to travel to and from the US via Tijuana Airport. After collecting my suitcase, I headed right to the border bridge and back into the USA, formally bringing to an end my trip to Mexico. US immigration was again a non-event and I was simply asked if I was bringing anything back from Mexico. My friend Dan from San Diego had graciously offered to make the 20 minute ride out to the Cross Border Xpress Terminal and pick me up for a ride into the city. We then drove over to Coronado. Looking over from Coronado to the San Diego city skyline. On the far right is one of the yellow Dole ships, unloading banana's from the weekly shipment from South America. 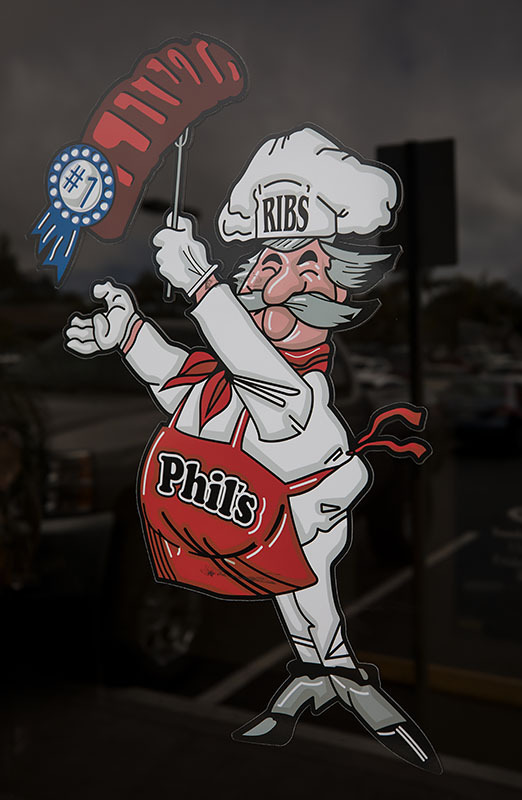 Next stop was to Point Loma where we stopped at Phil's BBQ for some lunch. The place was super busy with a quite a long queue out the door for entry into the main restaurant. Dan had a trick up his sleeve though and we entered via the side door and were quickly seated in the bar area instead. 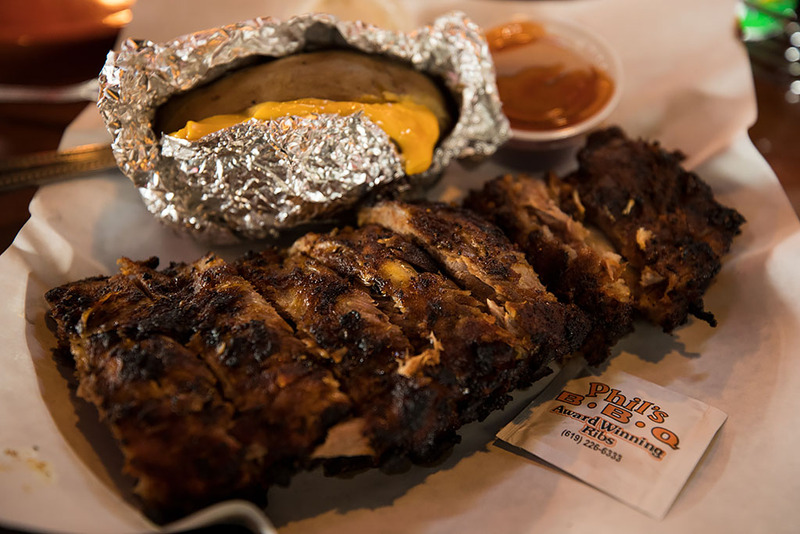 Some seriously tasty ribs and I was glad to get my fingers covered in them! 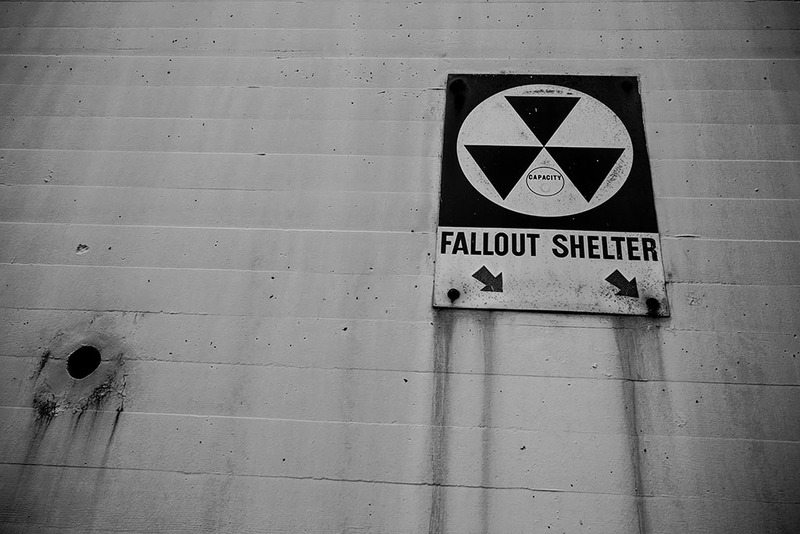 We then continued on to Cabrillo National Monument, passing a fallout shelter on the way. 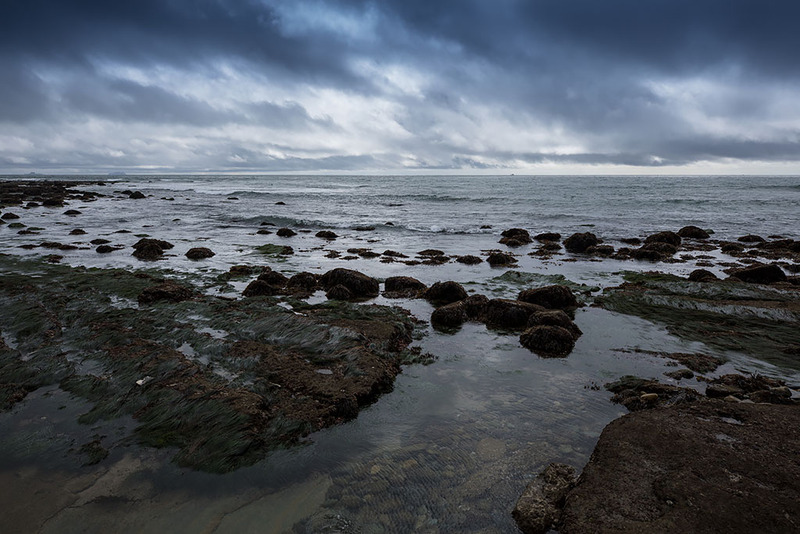 Cabrillo National Monument is situated at the southern tip of the Point Loma Peninsula and is a US National Park. It commemorates the landing of Juan Rodríguez Cabrillo at San Diego Bay in 1542, the first time a European had set foot on what would later become the West Coast of the United States. After parking the car, we walked along the path to see some of the rock pools and rugged coastline. Also visible in the distance was the USS Zumwalt, the futuristic and stealthy $4 billion guided missile destroyer of the US Navy. 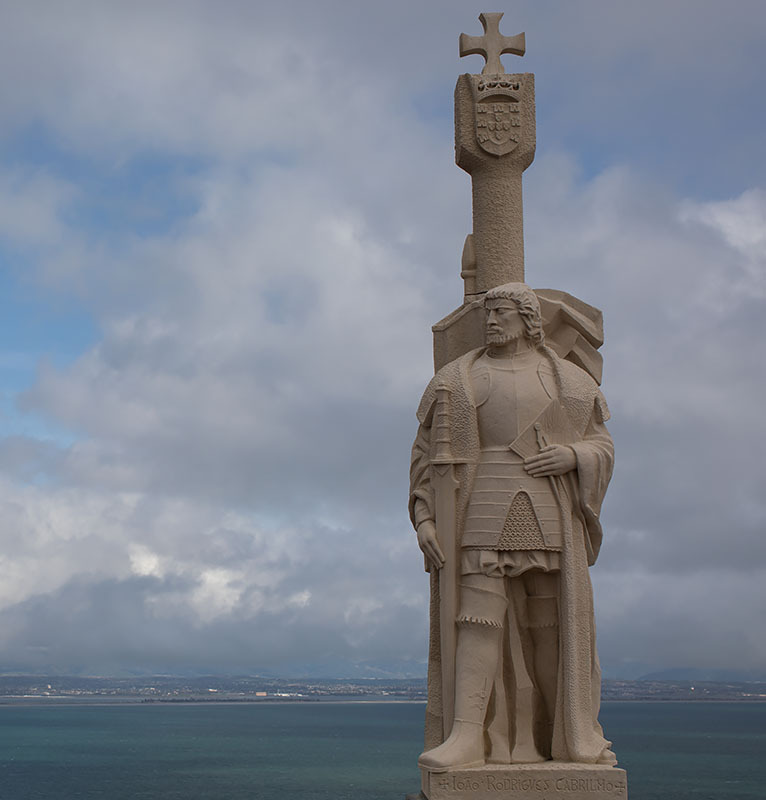 The statue of Juan Rodríguez Cabrillo with Coronado in the background. Looking over to Naval Air Station North Island. 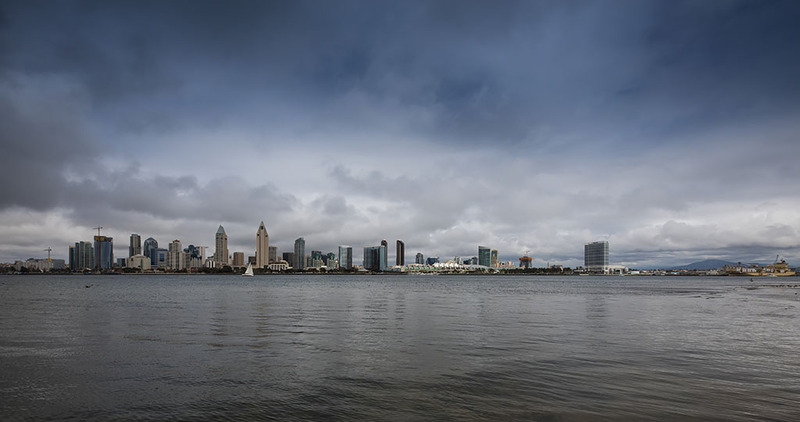 San Diego is the primary homeport for the Pacific Fleet of the US Navy and is homeport to the Nimitz-class aircraft carriers USS Carl Vinson and USS Theodore Roosevelt. 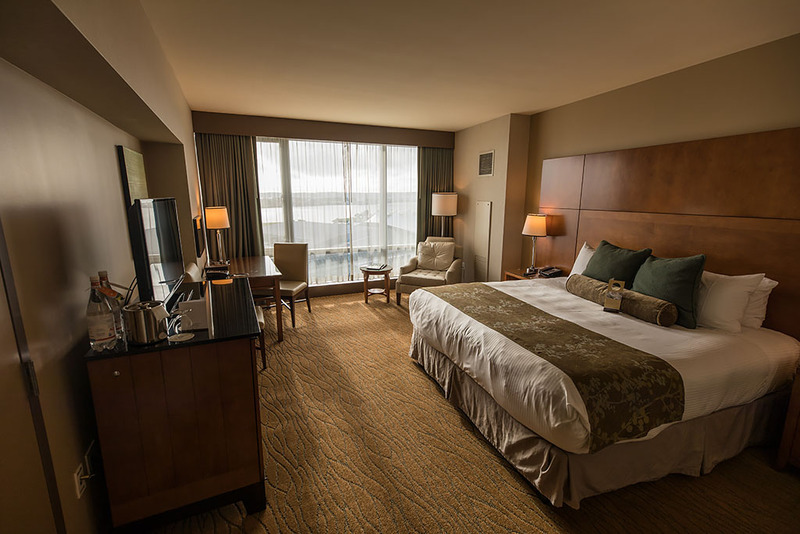 Dan then dropped me off at the Omni San Diego Hotel, where I checked in and reluctantly switched into work-mode, ready for a busy week across the road at the San Diego Conference Centre after the fun and eventful three days in Mexico City!